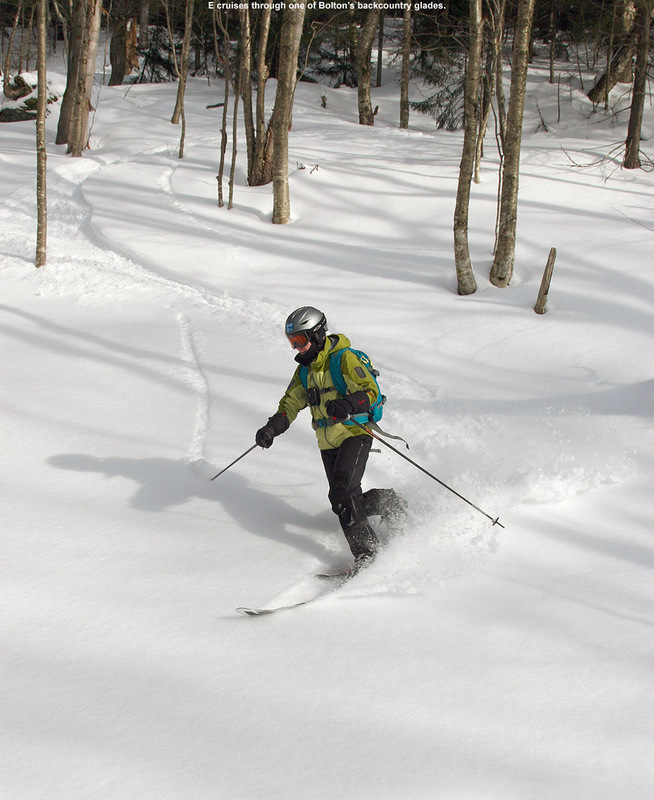 Our most recent storm brought up to 18 inches of snow to the Green Mountains, and while it was certainly much denser than Champlain Powder™, it provided a solid resurfacing to most areas. Based on the conditions we’ve had in the Northern Greens, it was hardly necessary, but a slope refresher is usually good, and this stuff is going to keep that mountain snowpack growing. 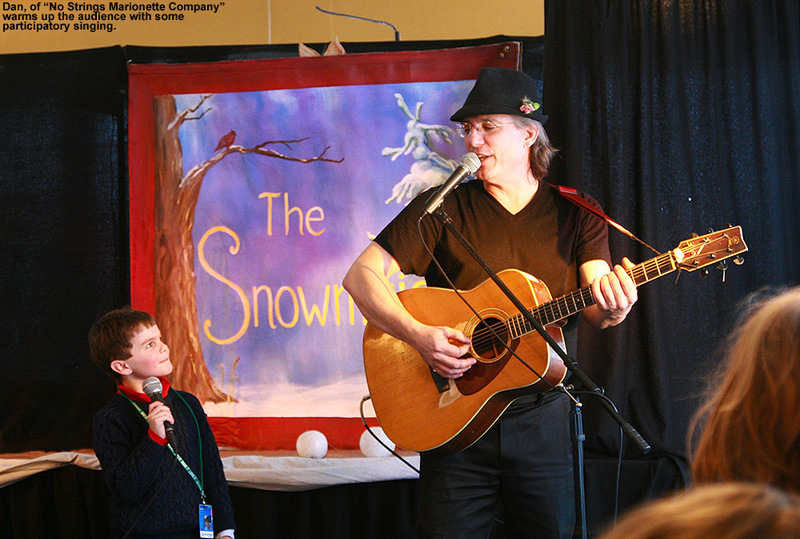 I was busy in the morning, but with E and the boys still on break they came and picked me up in Burlington so that we could get in some skiing in the new snow. E and Ty had been tossing around the idea of working on a report that Ty had to do for school, and they ultimately decided that they had to use some of the afternoon to get a jump on that. So, it was just Dylan and I that initially headed up to Bolton Valley for some afternoon turns, while E and Ty planned to join us later if the work went smoothly. In this area, snow has been falling all the way to the valley floors with the current storm cycle, but it’s still been fairly warm and the lowest elevations haven’t been accumulating snow except when temperatures drop overnight. 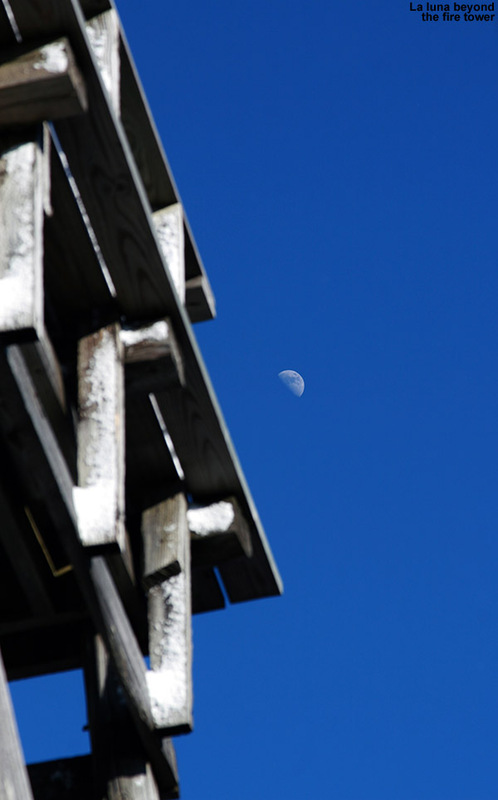 Today it was fairly warm as well, with temperatures around 40 F or so at our house when we headed up to Timberline. We found that the snow there was already wet and spring-like, and I knew we’d be heading to the upper mountain to get to the best powder for turns. Indeed the snow was much better up high – at the Vista Summit above 3,000’ it was still somewhat dense, but dry and ready to support some good powder turns. Being well into the afternoon, I decided to show Dylan some terrain off Ricker Mountain; we’d explored it before, but I doubt he’d remember that. The snow did get somewhat thick as we headed down in elevation, even just down to 2,800’. Dylan didn’t seem to have a problem, but if I stopped for extended periods I’d have snow starting to stick to the bottom of my skis. Fortunately, it would be cleaned off as soon as I started moving. We continued our run by making our way over to Wilderness, and that’s where we found some of our best powder of the day. 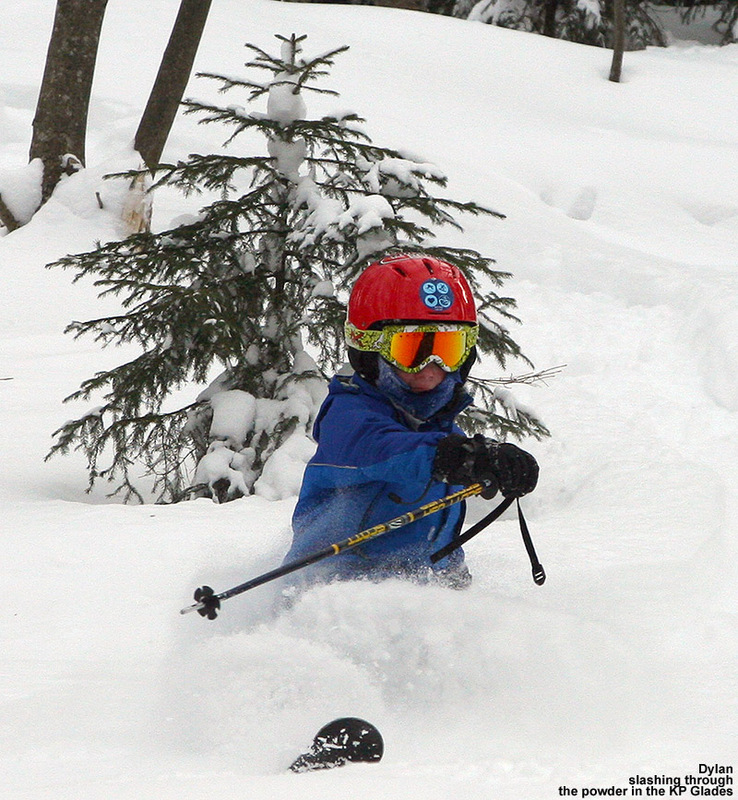 Although we were lower in elevation than we’d been before, the snow Wilderness Lift Line was holding up quite well. 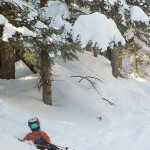 Our next run was a trip to the Villager Trees, and I gave Dylan his choice of line – he wanted the “Heaven” chute that he’d enjoyed the other day, so Dylan got first tracks through there. His run wasn’t without some adventure though – at one point he caught an edge and went flying head over heels. He was OK, but it took him a couple of minutes to realize that. Dylan wanted to catch a run on Adam’s Solitude, but once we got down to the lowest Timberline elevations and saw how sticky the snow was getting, I decided that we could hold off and catch it another time. While we were in the lodge getting a snack for Dylan, I saw that I had a new phone message. 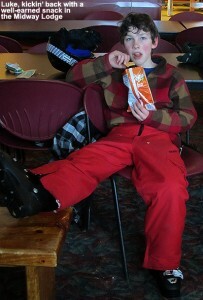 It was from E, and she said that they had finished Ty’s work and were thinking of coming up for some night skiing. 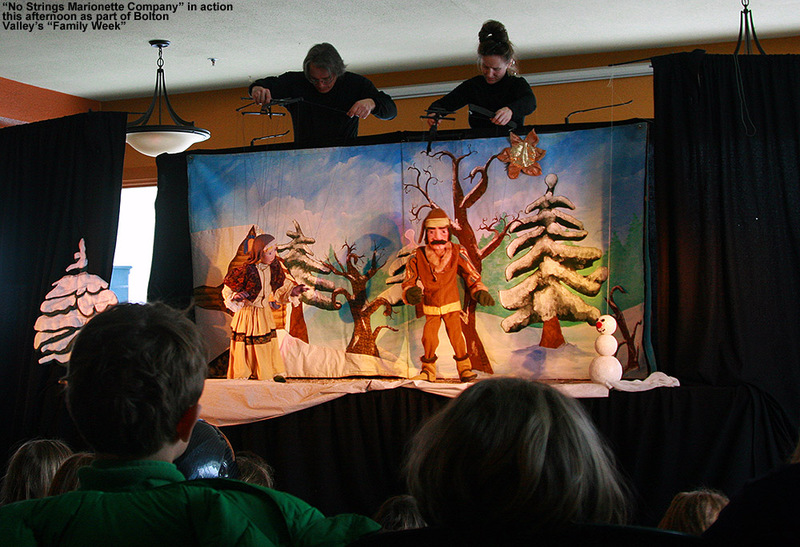 She also recalled that because it was Family Week at the resort, they had No Strings Marionette Company putting on a show up at the main lodge. We all planned to meet up, watch the show, and then get in some evening skiing under the lights. The marionette show was excellent as expected – No Strings Marionette Company had spent a week in residence at Ty and Dylan’s school, so we knew their work. Ty had brought his Telemark skis and Dylan switched over to his, so they spent the evening working on their Telemark turns. 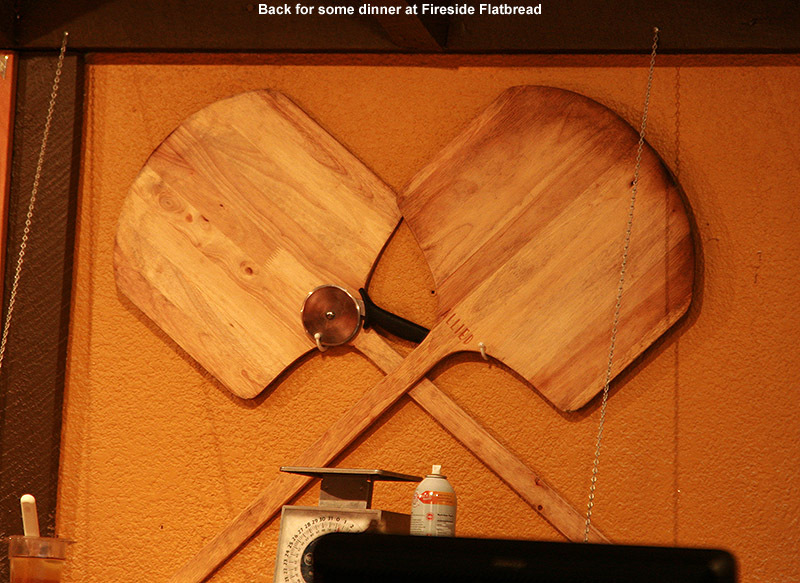 After a couple runs, we snuck in dinner at Fireside Flatbread, and I was really surprised that the boys hadn’t had enough skiing after that. 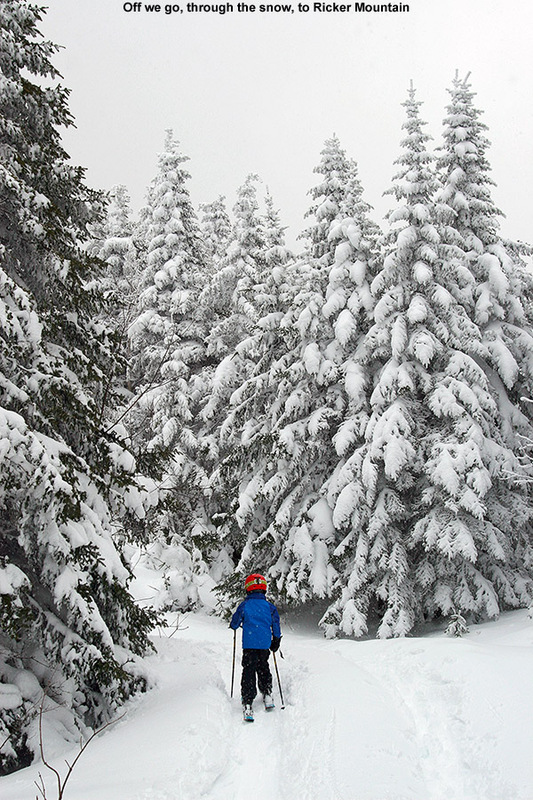 There was some really nice snow out there though, with the very best of it in the highest elevations. Dylan and I had noticed that the line of transition to notably wetter snow was about 200’ above the main base. The snow below that level was still OK, especially with skier traffic, but it was above that level that the new snow was driest and skiing really well. We started out with a typical training run on the Sherman’s Pass route, but Ty was eyeballing the impressively steep expanse of Spillway as we went by. I commented that Spillway was too steep for him to be working on Telemark turns, but of course Ty would have none of that logic. I acquiesced with the insistence that Ty practice Telemark turns even on the steep terrain, and by the next run we were dropping our way down the steeps of Spillway. 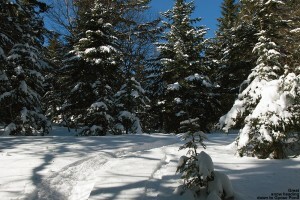 The snow was somewhat packed in the center of the trail, and even starting to develop a few moguls. However, the sides, especially the skier’s right where the terrain is somewhat invisible as it falls away from view, held a lot of deep loose snow that was either still sitting there from the storm or thrown their by the work of other skiers. 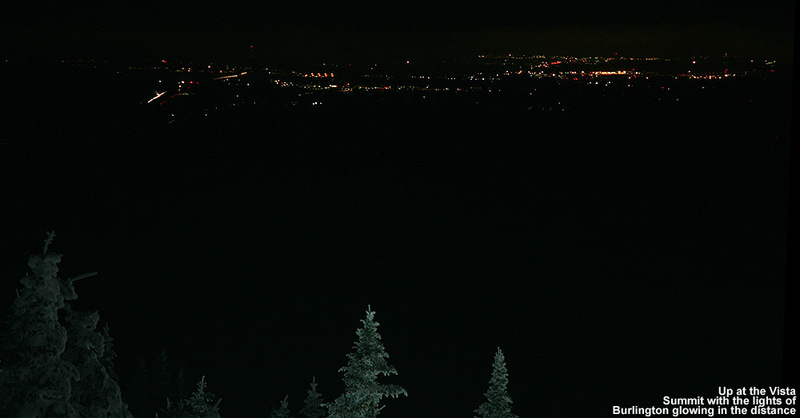 That terrain falling away from view also equates to it falling away from the assistance of the night skiing lights, and that adds quite a different dimension to the experience. With only the marginal assistance of the lights from the other side of the trail, it was quite a hoot making steep Telemark turns in down Spillway amidst copious chopped up powder. 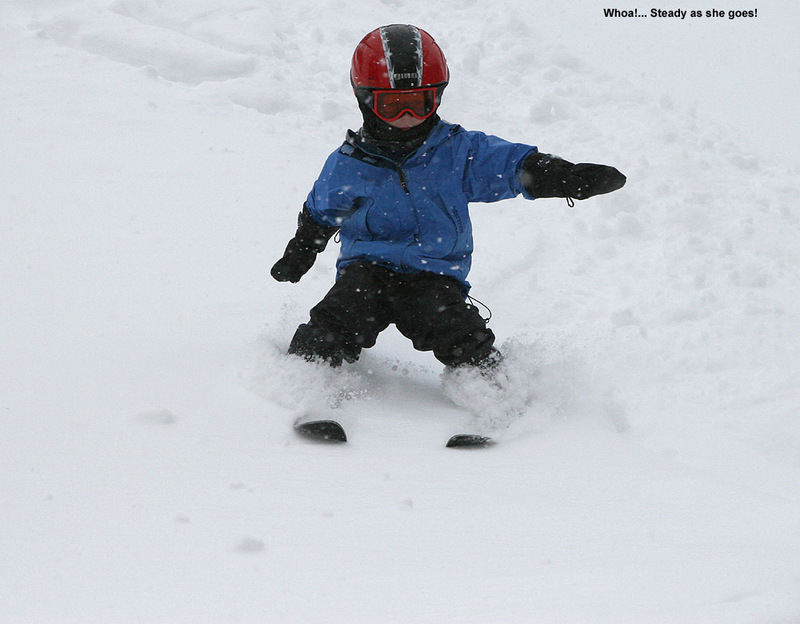 I found some beautifully soft lines of there, and it was a reminder of how even semi-packed snow can be a lot of fun. The boys were clearly having enough fun as well, because they wanted to keep doing more runs – we kept going until the lifts shut down. The sun came out for some glorious redemption after yesterday’s clouds and snow. Erica and the boys are on vacation from school this week, and it’s allowed us to do some planned media work with the folks at Bolton Valley Resort over the past couple of days. Since last week, the Monday afternoon/Tuesday morning period looked like the best window for sunny skies between storm cycles, so Josh arranged for photographers (Justin) and videographers (Dennis, Sam, and Daniel) to be on site and capture whatever Mother Nature would permit. Yesterday was a classic case of Mother Nature doing exactly what she felt like doing though – the forecast called for clearing skies in the afternoon, but as we drove up the Bolton Valley Access Road for a 12:30 P.M. meeting with Josh, we headed right up into the clouds. Those clouds didn’t show any signs of pulling away as we gathered in the, and in fact to emphasize their command of the situation, they decided to send along some snow by mid afternoon. It was actually some beautiful snowfall comprised of large, gently falling flakes, but it was clear that we weren’t going to see the sun. 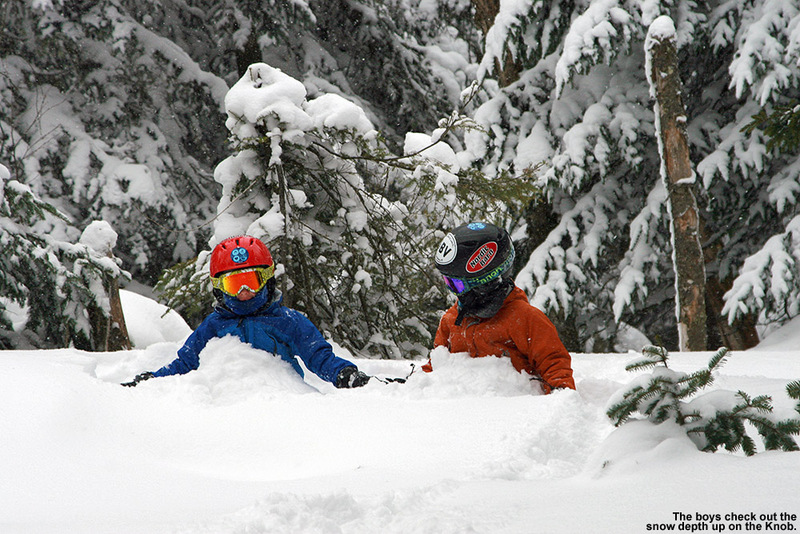 With the clouds and snow, we laughed about how that was life in the Northern Greens, but that really is a good thing, even if it means a bit of waiting for prime ski marketing images. Fortunately, Josh knew how to make excellent use of the weather, and he took care of getting all the interior work done. We had several families with lots of children, and Justin set up a variety of images in a couple of the hotel rooms. 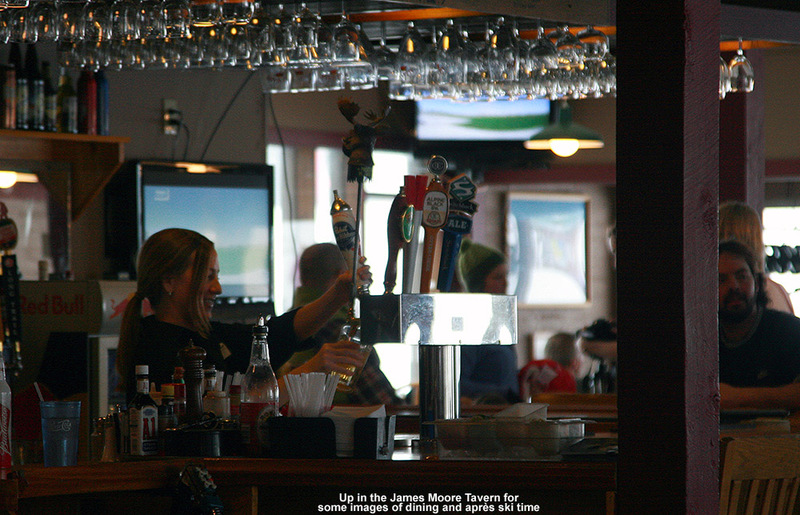 Later we went over to the James Moore Tavern and got some dining and après ski shots there in front of the fire with pizza etc. I had a good time, although it was definitely a lot of sitting around for Ty – he was getting pretty cranky by the end. He was in sore need of some outside time on skis, so we were definitely hoping that the following morning would bring some sunshine with it. 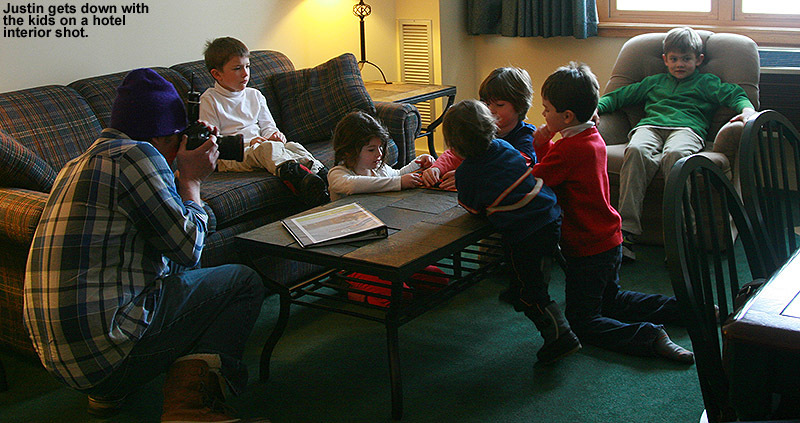 Justin works with some of the kids to get interior lifestyle shots at the hotel. 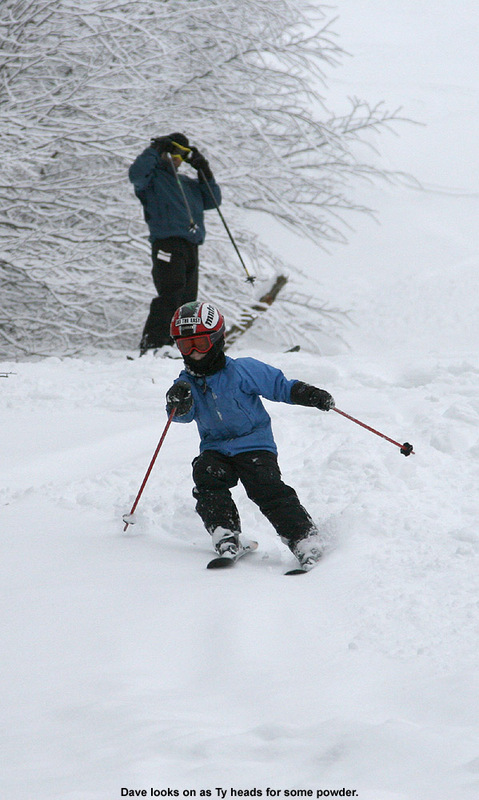 I had some work to do in the morning, but E and the boys were up at the mountain by 7:45 A.M. to kick off the day. The media crew got to hit the lifts before they opened to the general public, and Dylan definitely enjoyed getting to ride one of those early chairs. The crew did some shooting on Alta Vista and Cobrass, including what sounded like a fun time up at the Cobrass Café with the kids playing around in some of the deep snow. It wasn’t 100% sunny, but there was great sun at times among puffy white clouds, and that made for some decent lighting. 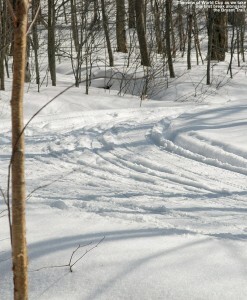 I also heard everyone went for some off piste fun in the Cobrass Woods. Ty dropped a pretty big rock in there, although it wasn’t caught on film. I arrived at the mountain around midday, and as I was putting on my skis at the base of the Vista Quad, I ran into Daniel shooting video with his Canon EOS 60D. He took advantage of my appearance and captured a tight video shot of me clicking into my alpine skis. I made a run on Cobrass to catch up with the group, but didn’t quite overtake them until they’d already headed in for lunch. I did need to eat as well, so that worked out for me, and E and the boys got to tell me all about their morning. There was of course a lot of stopping during that morning session with all the photography and videography, but they’re somewhat used to that from hanging around with me all the time. All the children (who ranged from roughly age two to teens) seemed to be handle the waiting, although fortunately that’s a lot easier to do when you’re out in the fresh air. It was good that temperatures were very comfortable being right around the freezing mark, so nobody got too cold hanging around. The crew reassembled for a couple more runs in the afternoon. We headed over to Timberline and Justin took a number of shots of pairs of skiers skiing together and buzzing the camera. Families were often mixed up for variety, but our family did get to ski together for some shots where the four of us were in a row and Justin skied right behind us. The boys did a great job of holding their position, and Justin was appreciative. 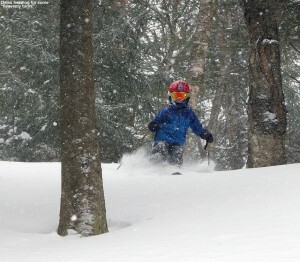 Ty got into some powder on one of his runs along the edge of the trail, making some impressive turns tight to the trees. Justin had to get along to Burlington by mid afternoon, but as we got toward that point we were starting to lose the sunshine anyway as clouds became more numerous. Even though it wasn’t perfectly sunny at all times today, it was definitely a great one with a bit of spring in the air. The freezing level rose up pretty high – the Bolton Valley Weather Station at 2,100’ got just above it to 33.4 F, and judging by the look and feel I bet that freezing line got up to ~2,500’. There was a bit of a previous melt crust off piste below the 2,000’ mark in exposed areas, but powder was nice (albeit dense) above that level, and the groomed slopes were just beautiful everywhere. 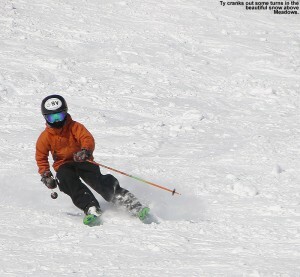 There was even a bit of a spring corn feel to the snow down near 1,500’ on west-facing terrain at Timberline. In any event, it was great getting some sun after being socked in yesterday: That sunny window is closed now though – those afternoon clouds were harbingers of the next storm coming into the area. It looks like it’s going to show some strong elevation dependence, but totals could be good up in the higher elevations were temperatures remain cool. Bolton Valley’s new material from this week’s photo and video shoot is already being put to good use! We’re hoping Josh gets plenty of great images and video from the session! 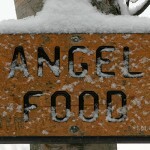 Ty on Angel Food today – conditions are simply fantastic at Stowe right now and it’s a great time to hit the slopes. 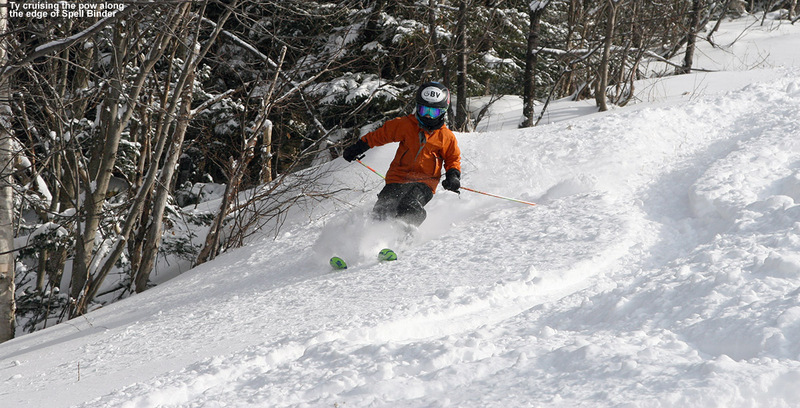 Today was back to ski program at Stowe, and with the recent snows we decided to make it an early day and get in some turns in the morning before our actual sessions started. After charging the boys up with a good breakfast, we headed off to Stowe under cloudy skies and temperatures running a pretty consistent 35 F in the lower mountain valleys. 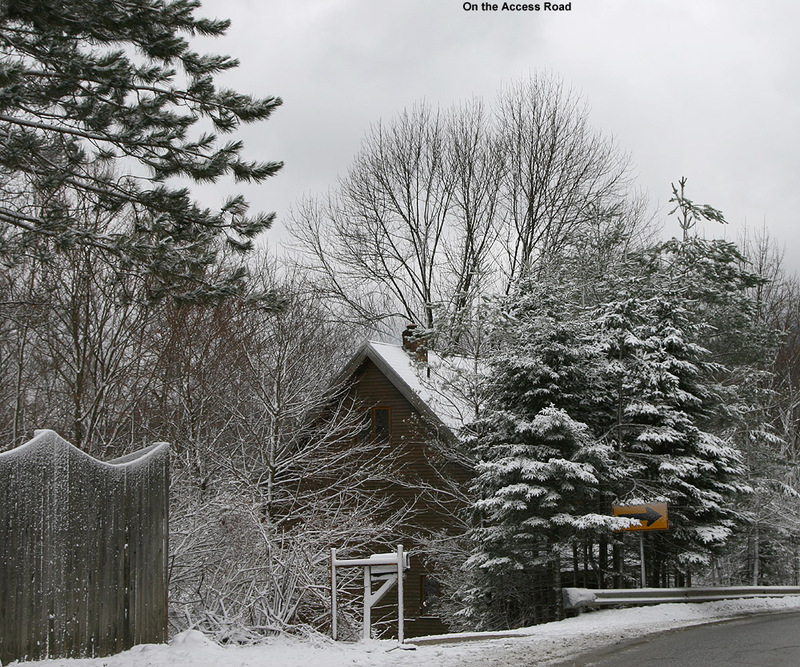 The temperatures slightly above freezing created a cascade of wet snow slowly slipping off trees, roofs, and most other objects as we traveled through those areas. As we ascended to the resort base elevations, the temperatures finally cooled down to around the freezing mark, and we were greeted with light snow falling. After my reconnaissance run on Angel Food on the 14th, I was planning to bring my group out there today. 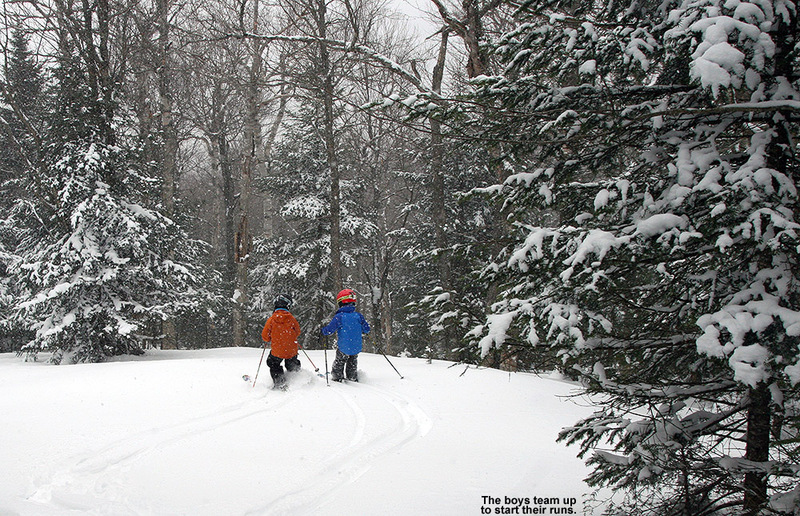 I figured it would be fun to give E a chance to ski the area since she’d never been out that far, and it would provide Ty and Dylan with a preview so that they could be helpful with guiding when we brought the other boys out there. Descending from the top of the gondola on Upper Gondolier, it was immediately obvious just how good the snow surfaces were. 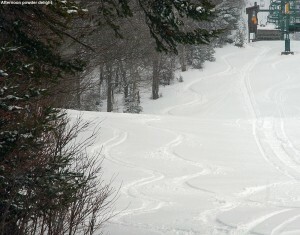 The combination of the past two storms has really done a great job of resurfacing the on piste areas. Conditions out on Angel Food were quite good – we skied the standard route and mostly tracked snow, but it hardly mattered because the snow was so soft. 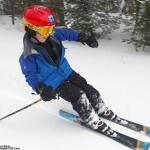 E hasn’t skied Stowe on alpine skis with the boys in quite a while, and she was very impressed with the pace at which they seemed to fly through the challenging terrain. She’s definitely worried that the boys are starting to surpass her in aspects of their skiing – at least on alpines. One of the interesting things we noticed while out on Angel Food today was the number of people using the route to skin up the mountain. I guess it’s a convenient way to go so that one stays out of bounds for an ascent. 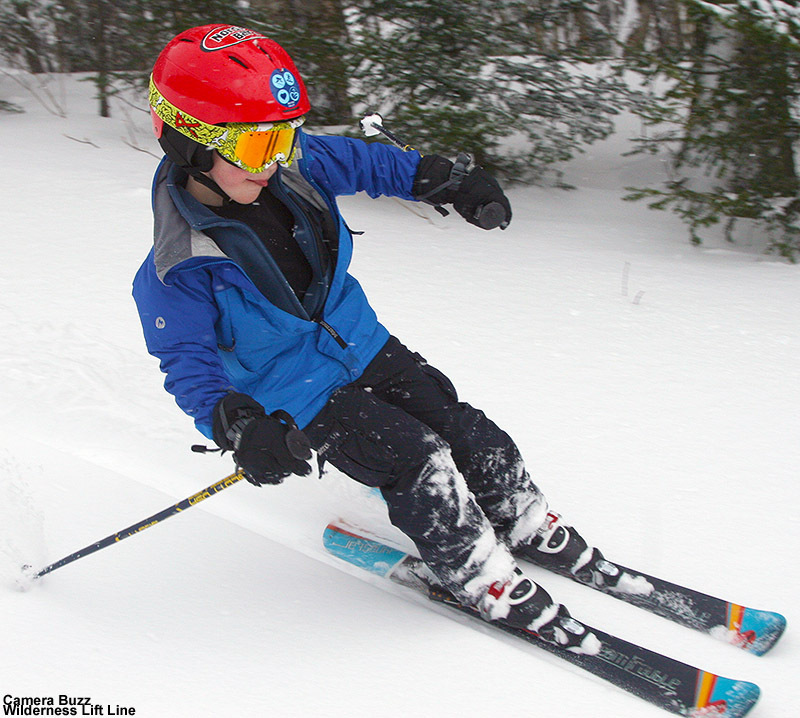 We made one more gondola run on Perry Merrill so that E could check out the potential for some of her intermediate students, and I noted that with conditions being so good, it could be a real confidence builder. Ty and Dylan kept up their fast pace of ascent, even racing on the last pitch of Perry Merrill with E’s approval, but I assured her that we did not do things like that during our regular session time. Our next stop was lunch at the Great Room Grill – I tried the salmon burger for the first time and it was quite good. It comes with an interesting side of coleslaw that has some unique raisins in it. 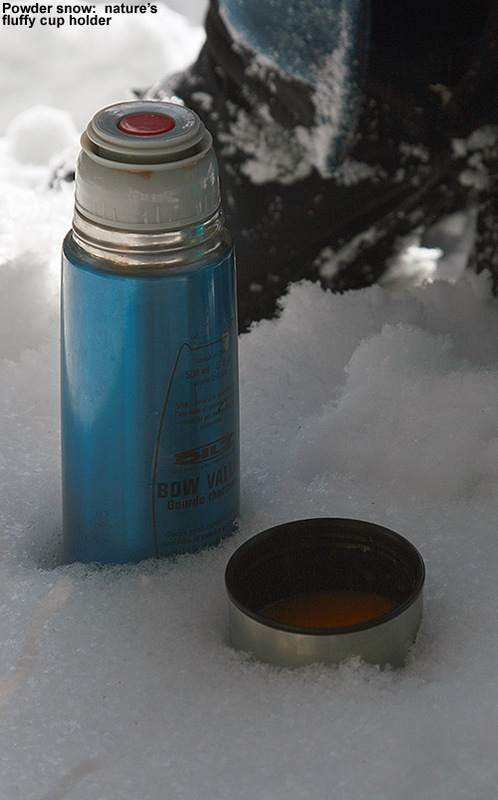 We wanted a good meal because we were expecting to push hard all afternoon with the great snow that was out there. We’d already learned that Ken wasn’t going to be able attend our afternoon session, and in the end we found out that Jack was also out, so it was jump me, Ty, Dylan, and Luke. Our first stop of the afternoon was the standard Angel Food run, and it was a huge success with Luke. After difficulty in the Bench Woods, he was very impressed with how much better Angle Food was. We continued on next with his selection of the Nosedive Glades from the Cliff Trail side, and then another selection he’d mentioned – Hackett’s Highway. 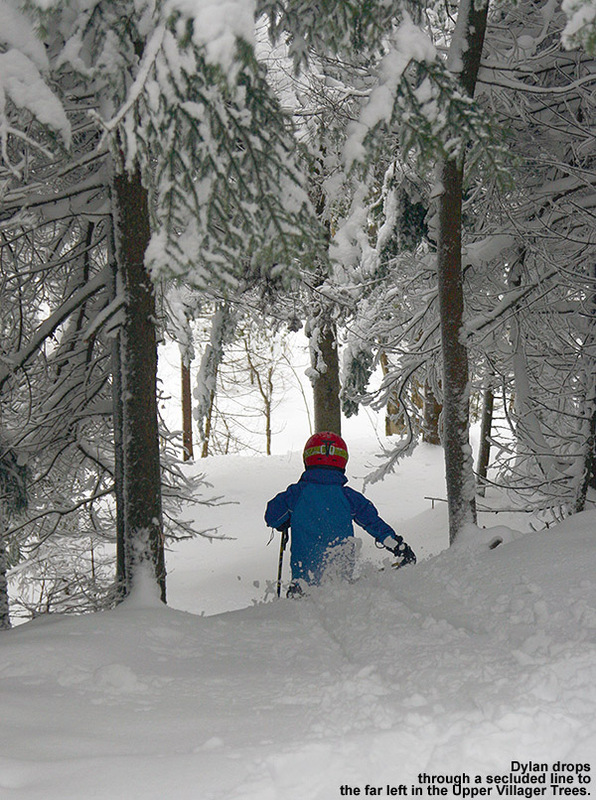 We sampled some great woods in various places off the Fourrunner Quad – the off piste is skiing really well right now and you can essentially jump into any line you want. Back at the Gondola we had a long run through some of the Gondolier trees and the finished off the day back at Spruce with some trees and most of the terrain above Meadows. Even that terrain right down near the base was skiing stupendously. We had dinner in Stowe on the way home, trying out Charlie B’s Pub and Restaurant. 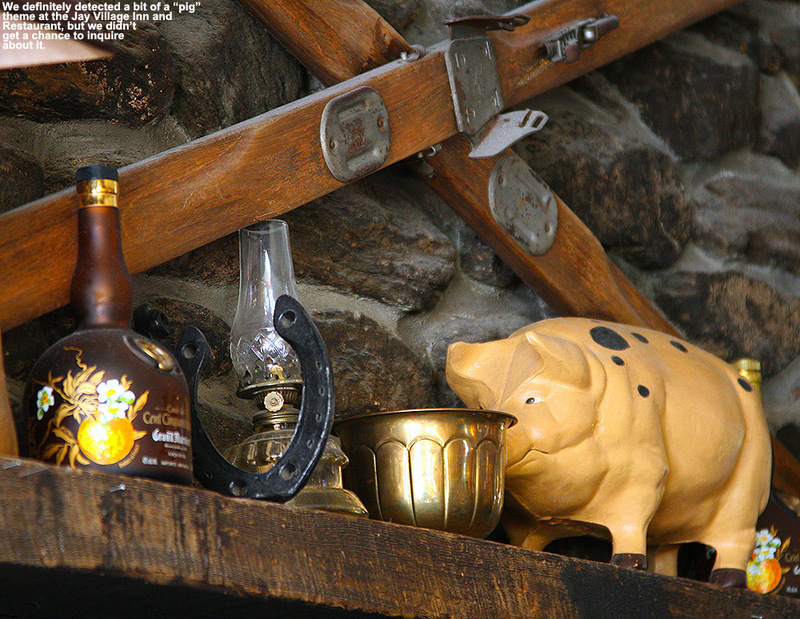 It’s associated with the Stoweflake Mountain Resort and Spa, and has a nice cozy atmosphere. 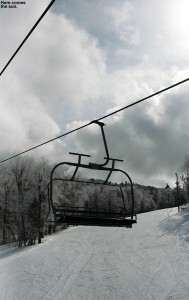 While we were there, we also got to watch footage from the Stowe Derby that had taken place today. It’s fun to watch people try to negotiate those curves on the Toll Road on Nordic skis – that takes some serious skill. As an overall comment on the day, I’ve got to say that the skiing is simply fantastic right now in both a qualitative and quantitative sense. The snow from the current storm was denser than fluff, and even though it hasn’t been a huge storm, it’s contributed quite a resurfacing when combined with the midweek storm. 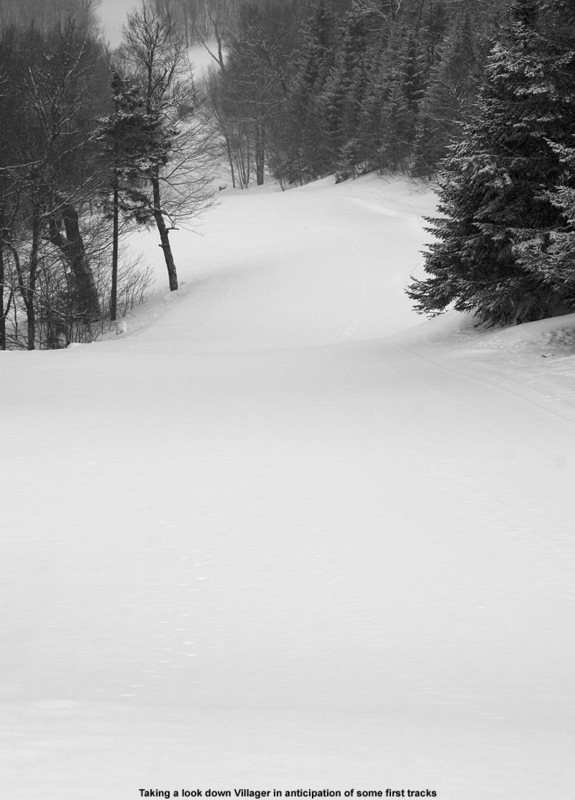 For me, today’s skiing at Stowe had a bit of a Whistler Blackcomb feel to it; the peaks were shrouded in clouds, snow was falling, and the snow underfoot was semi-dense with plenty of meat to it that covered up the subsurface. I’d say the part where the experience differed was that you could head all the way down into the village elevations and you wouldn’t get into that sticky snow that can so often be an issue as you get down toward Whistler Village. While dense, there wasn’t any stickiness from top to bottom – at least down to the 1,500’ elevation. Part of the Whistler Blackcomb issue of course is that they’re covering 5,000’+ of vertical, but today’s snow was like a good slice of 2,000’+ from somewhere up in the higher elevations. In terms of quantity, the stake is at 65”, so right around that average mark, and average for this time of year is pretty sweet. These last two storms have clearly pushed things to another tier of coverage off piste; we were skiing and seeing lines that we’ve yet to this season, and the skiing in many areas has taken on an entirely new dimension. Anyway, now is the time to go if you’ve been waiting to ride the Northern Greens. 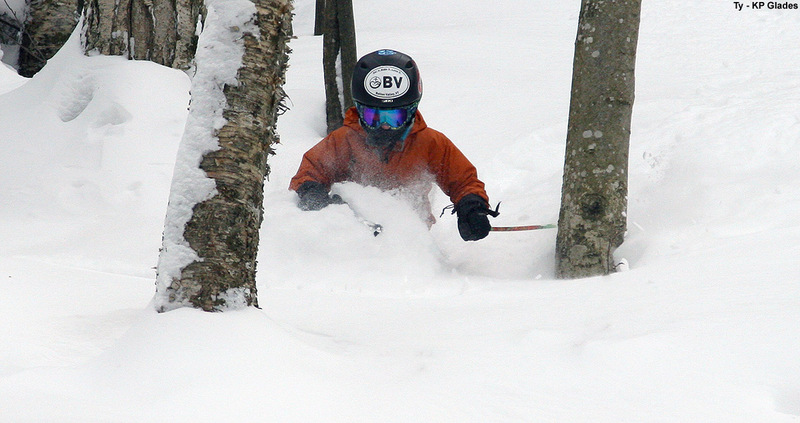 Dylan drops into a powdery line in the Villager Trees today. Snow from our current storm was just starting up when he headed up to Bolton Valley today – at roughly 11:00 A.M. we went from scattered flakes down the house at 500’ to a steadier light snow up at 1,500’. 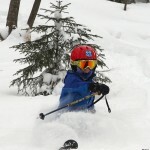 After my quick trip to the resort on Thursday to check out the snow from our midweek upslope dump, I made note of several places to go to get E and the boys some powder turns. So, after stowing our lunch in the Timberline Lodge, we hopped right on the Timberline Quad and got to the Timberline Summit. The intensity of the snowfall increased as we headed up in elevation, and as we headed over to the Village we could feel how the groomed slopes were already taking on that coating of fresh snow. We rode the Vista Quad for the next leg of our trip, and indeed the intensity of the snowfall increased again as we headed still higher in elevation. 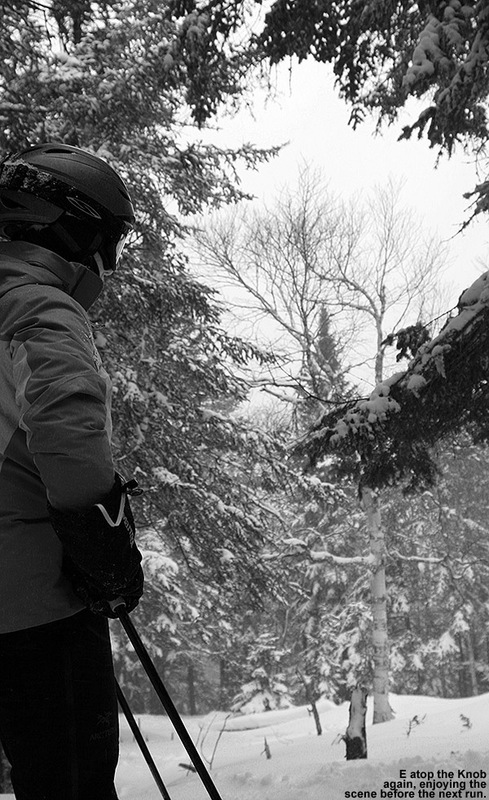 We had to hunker down against a somewhat easterly wind that was blowing in our faces as we rode the lift, but we knew we’d be into the protection of the trees soon enough. We found the snow surface on Cobrass to be very impressive – the mountain presumably made some snow on the headwall and has been able to keep things in very good condition ever since through grooming etc. E said that it was some of the best conditions she could remember seeing there. 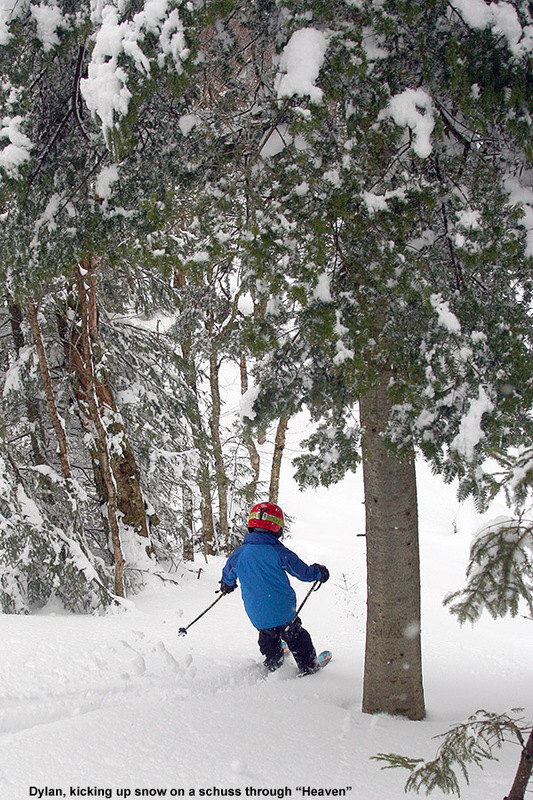 We worked our way into the Villager Trees and found some excellent snow conditions, then we headed up to “The Knob” for some additional turns. The boys were in very good spirits, and demonstrated some excellent teamwork as they got the gear up through “The Crack”. We hit a nice steep line bringing us back down to the main thoroughfare in the area, and the boys were extremely enamored with the skiing. 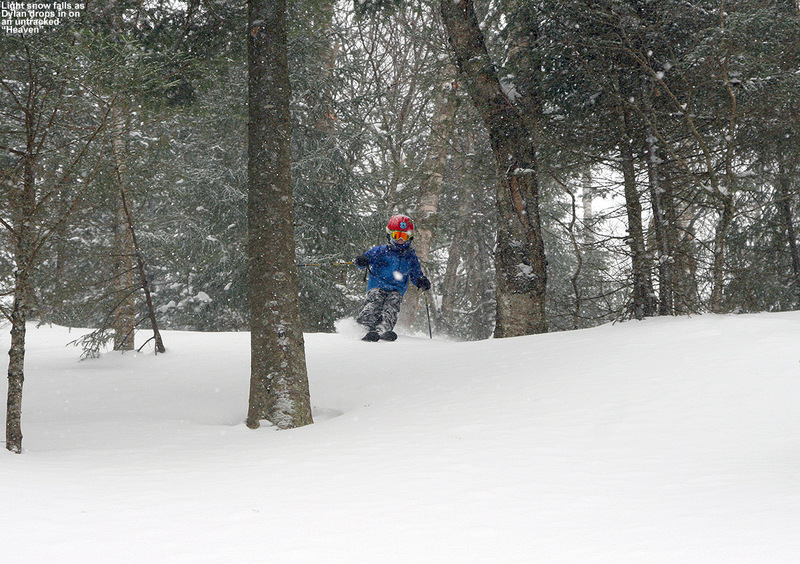 Dylan said “That was heaven!” and Ty insisted “I could ski that all day!” Anyway, they were very impressed with the snow. 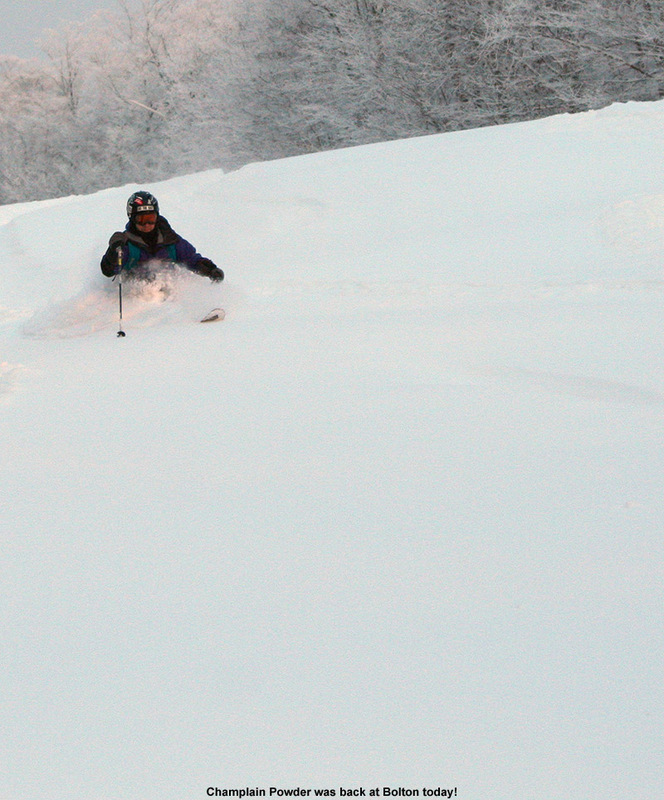 We were still skiing in areas that hadn’t seen traffic since the last storm, so there were some deep turns to be had. The settling of that snow plus the new synoptic snow falling on top of it meant that it wasn’t the ultra fluff that was available right after that upslope dump, but it was soft, bottomless, and only getting deeper as the snow continued to fall. We finished off the long run all the way back to the Timberline Base, catching some good turns on Lower Tattle Tale and Spur. That had been a long circuit, and the boys were ready for lunch by the time we got to the lodge, but their spirits were high. They had enjoyed it some much that they requested doing the same run again. That was really impressive because it’s the first time I can recall them wanting to head to “The Knob” a second time. But, the snow was really good, and they had the fever for that fresh powder, so we did the same circuit again as soon as we were done with lunch. The snowfall intensified as the afternoon wore on, reaching up to an inch an hour at times, but it was typically in the moderate range. At the end of that run, Dylan fell right near the lift and hurt his thumb, so he went inside with E to take a quick breather, while Ty and I went for a run off the Timberline Mid Station. Ty and I headed out on the traverse toward Doug’s Solitude, and found some good turns, but that area still needs a bit more snow since it’s fairly low elevation and it’s south facing. The Solitude traverse was really fun though, Ty enjoyed that best as he sent himself off every jump and bump he could find. 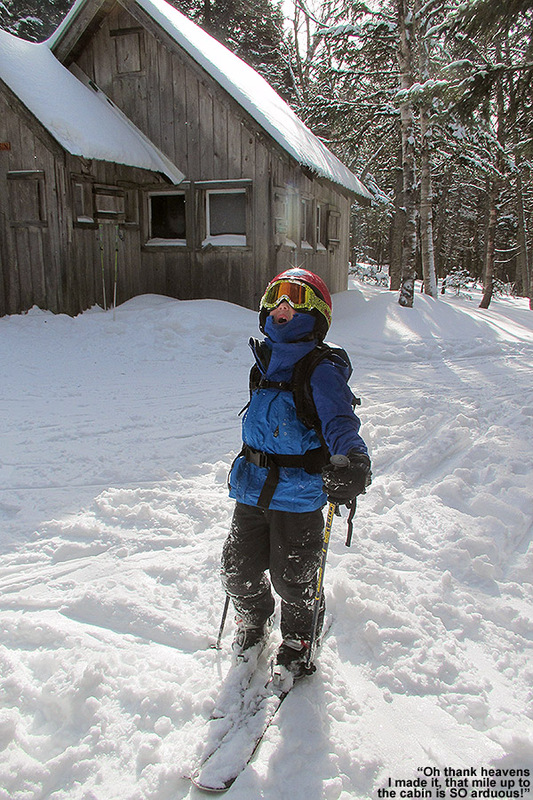 When we got back to the lodge and found that Dylan was fine but calling it a day, we decided on one more run. Ty wanted to get back to the Solitude traverse, so I introduced him to some of the lines in the Intro Woods and then we eventually worked out way back down to the Solitude traverse. It’s still weird how the traverse has been modified to accommodate the off road driving school, but at least most of it is still intact. At our car at 1,500’ I’d say there was about an inch or so when we left, but there was some wind so it was difficult to get a good read on it. The temperature at that elevation was 30 F around 4:00 P.M., so we were curious to see how warm it was in the valley and if any snow was accumulating. Indeed we found that snow had accumulated all the way to the bottom of the access road (340’) even though the temperature appeared to be in the 34-35 F range. It seemed like there was a new inch or so at the base of the road, but it was even colder and snowier when we got to our house (~500’). 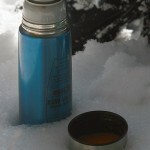 I found a temperature of 32.5 F and 1.8” on the snowboard. Since that point the snowfall has been of lower intensity, with 0.8” additional as of 10:00 P.M. 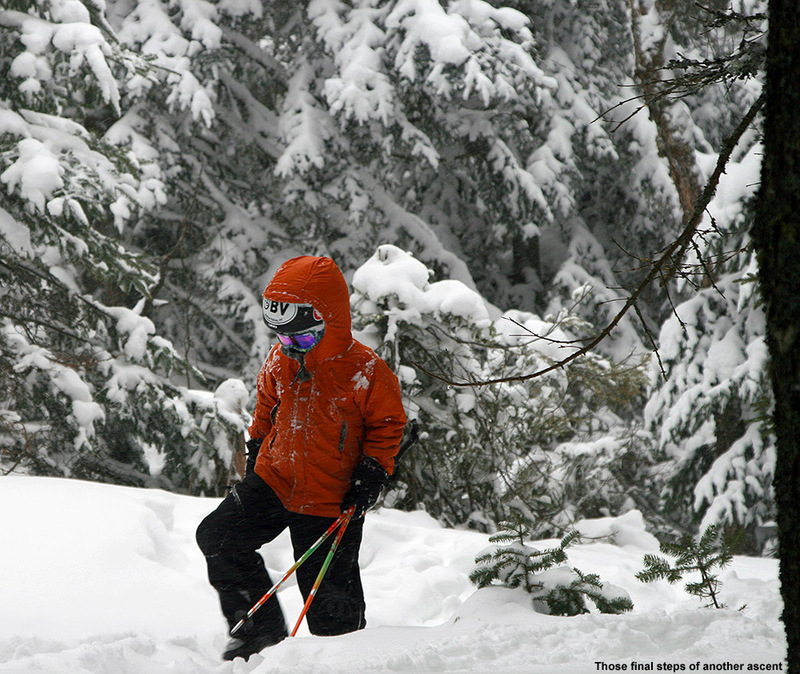 The snow continues to fall tonight; it’s probably not going to be heavy, but it should make for some fresh surfaces tomorrow and we’re going to try to get in some early turns at Stowe before our BJAMS ski program if we can. 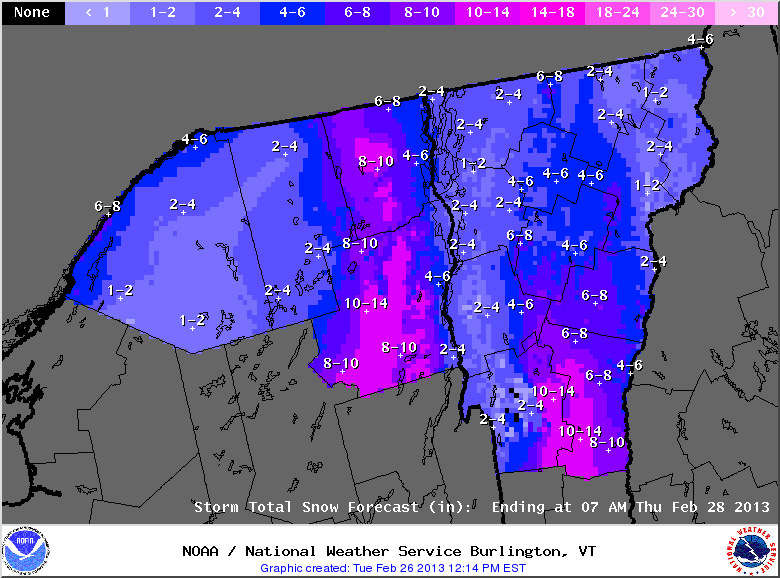 There’s also another potential storm coming to the area during the midweek period, so we’ll be watching for that one. People have been talking about the potential for upslope snow on the back side of our current storm cycle for days, and indeed it delivered. 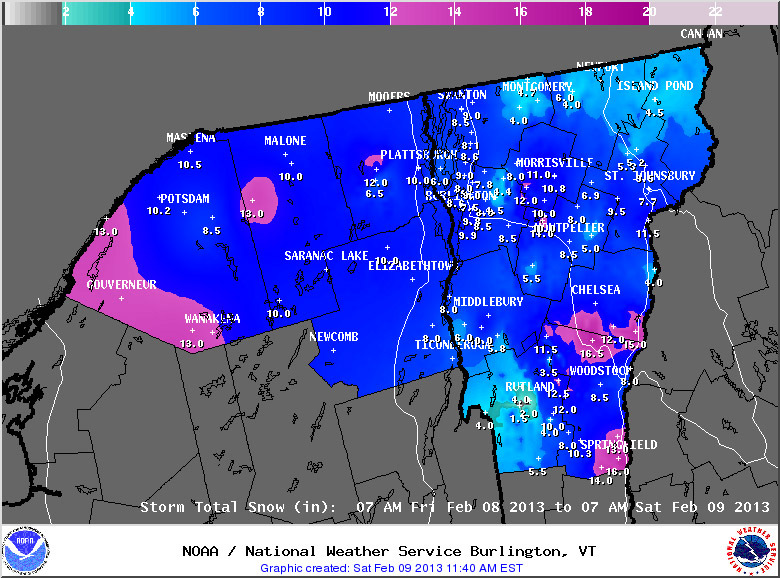 Just as the National Weather Service Office in Burlington predicted a few days ago, Jay Peak was the jackpot for this one, pulling in 27” of snow for the storm. 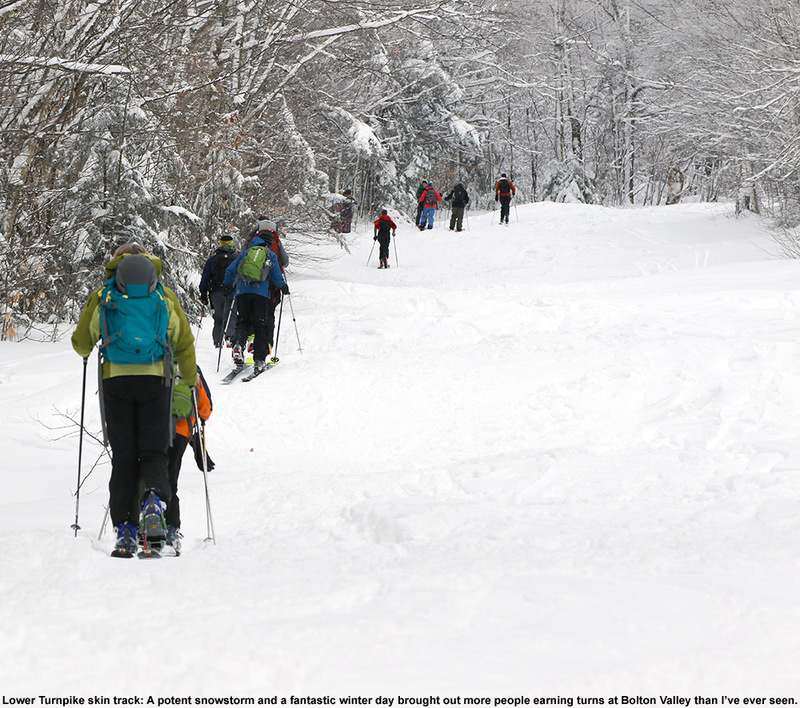 From there, it was just an easy walk down the spine of the Green Mountains with the snow totals falling in line: 24” at Smuggler’s Notch, 18” at Stowe, 16” at Bolton Valley, and on downward into the Central and Southern Greens. 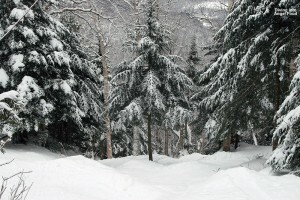 The early morning pictures from Jay Peak were impressive, as parked cars already began to disappear in the snow, and although I was busy in the morning at work, if I found the time I was going to have to hit the slopes in the afternoon. Since I’m writing this, you can guess that I found some time. I got up to Timberline in the mid afternoon and caught a ride on the Timberline Quad with a bartender on his way up to work at the James Moore Tavern. 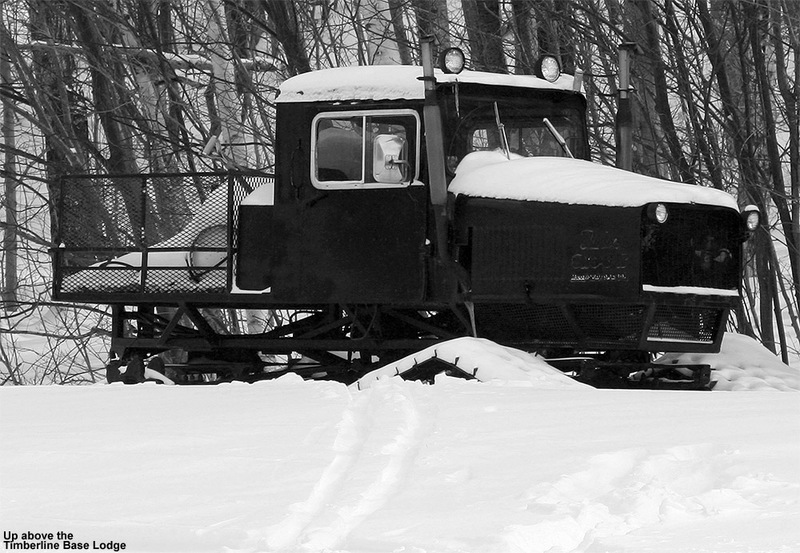 He lives at the Bear Run Condos, which are slopeside along the Timberline trails, so technically this was his “commute” to work. There was hardly anyone around on the lift since it was getting pretty late in the day, but because he was with me he decided that he’d count it as car pooling. In order to ski home, he often catches a ride to the top of the resort with one of the groomers late in the night when he’s done his shift at the bar, and he said that last night during his nightly excursion, the snow was coming down like mad. It sounds like he had a fun “commute” home last night. Snow surfaces had been pounded pretty flat by the wind when I’d last visited the resort on Monday, so I figured that it was really going to take a good dump to invigorate the surfaces. I was somewhat skeptical that this storm would be enough… until I took that first turn in the powder off to the side of Villager. 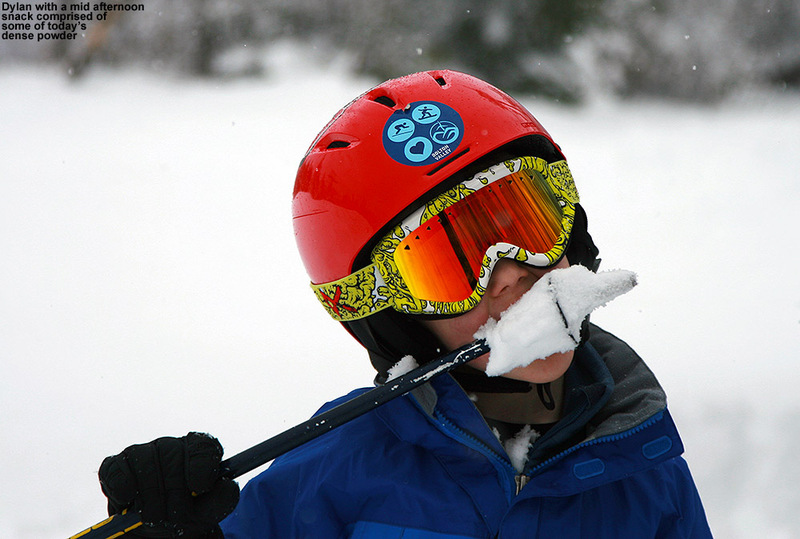 It wasn’t just good, it was really good – even by Northern Vermont standards. It was somehow really dry, while still being bottomless. 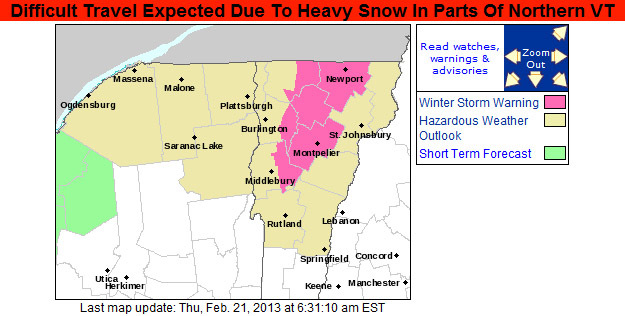 What I’d forgotten was that the resort had picked up some denser snow yesterday morning, and that was sitting down below this latest Champlain Powder™ fluff. 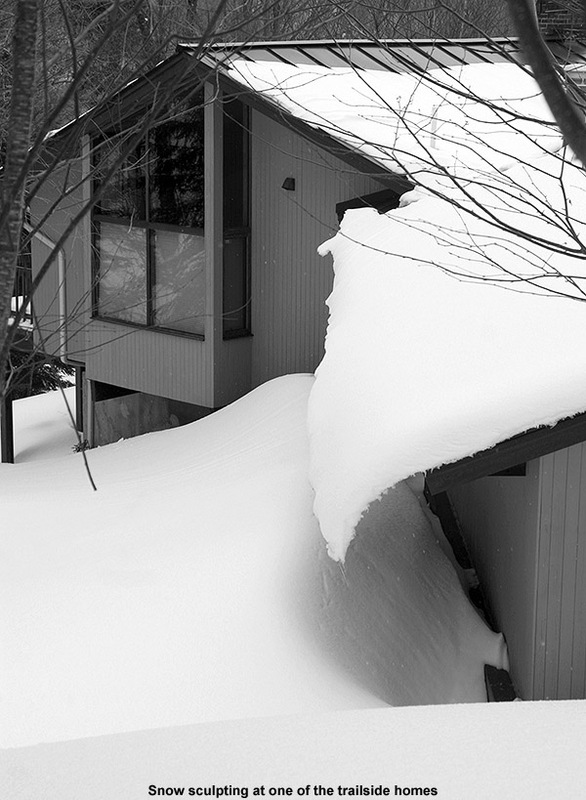 That sequence created a beautiful right-side up combination of snow layers. 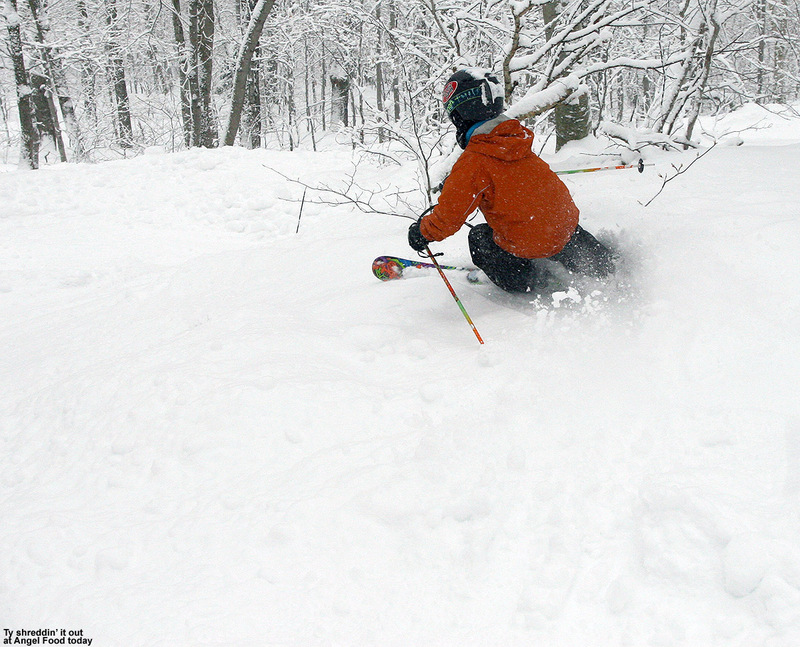 Powderfreak found the quality worthy of comment as well on the American Weather Forum, so indeed it was some impressive powder in which to make turns. Since it was mid afternoon and people had been out skiing the fresh snow all day, I didn’t really have the run of the resort so to speak with respect to powder. The wind was also having its way in some exposed areas, but I knew where to go. 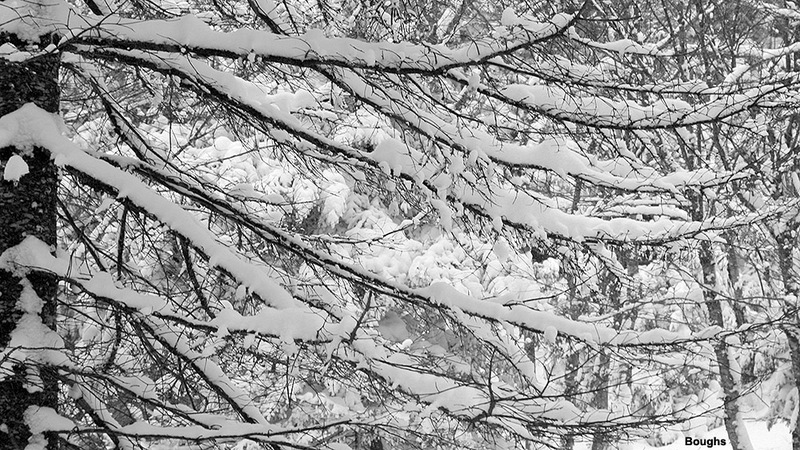 From the Vista Summit I made my way down into the Villager Trees, where the snow was protected and there was plenty of untracked powder. 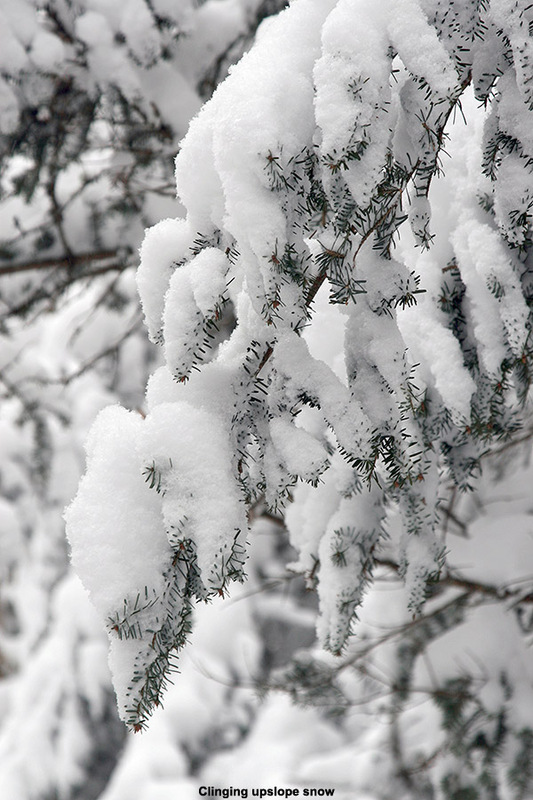 The trees in the there were glorious to behold with all the delicate powder layered on them. 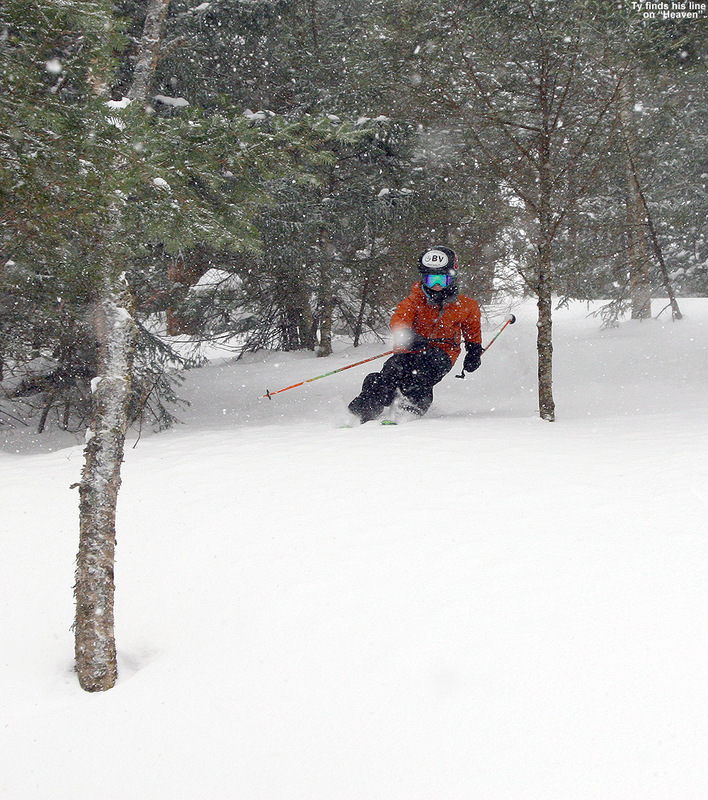 I got into some good lines off The Knob, farther skier’s left than I’ve been this season. I probed the powder in various places during my travels, and the measurements all came back in the 15-19” range for settled depth. I don’t believe that was all from this storm in areas that hadn’t seen much traffic, but things start to get deep when it’s powder on top of powder. The fluff was everywhere today. Since my car was down at Timberline, I was able to finish off my day there, and I caught some nice turns upon traversing over to Lower Tattle Tale. 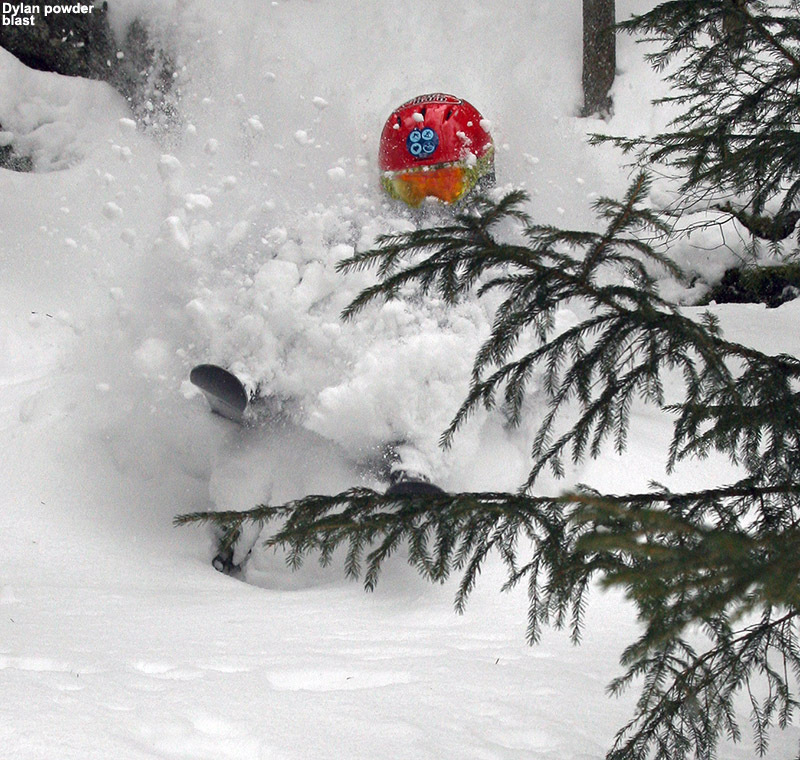 The Tattle Tale headwall was scoured, but boy was there some deep, well-protected powder on the lower half. I had the trails to myself since it was the end of the day, and Spur was particularly enjoyable as I followed the main track and skirted in and out of the powder on the sides to check my speed. I caught a little bit of powder on the bottom of Spell Binder, and I’m sure it was nice getting fresh tracks there this morning. The bulk of this storm was really focused on the Northern Greens, and the skiing has definitely stepped back up a notch after getting pretty flat and beaten down over the weekend. This was a much needed dump of snow with so many of the big synoptic systems missing off to the south of the area, and the snow depth at the Mt. Mansfield Stake has reached 65”; it’s finally gotten back above average after being below for a month and a half. We’ve got the potential for a modest snowstorm this weekend, and then another next week, so those could really help to keep building the snowpack if their tracks are halfway decent. 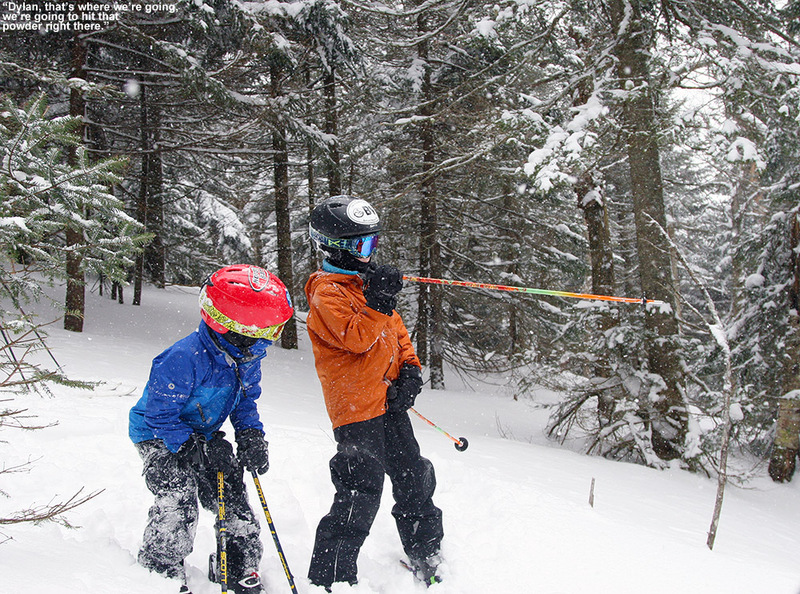 The weather was quite nice on Saturday, so we had a good family backcountry outing at Bolton Valley, but the weather yesterday was simply nasty. I contemplated heading up for a quick tour, but when I saw that the Bolton Valley Village temperature was at 3 F around midday, I wasn’t all that inspired. When I checked again in the afternoon, I saw that it had actually dropped a degree to 2 F. As if the cold temperatures weren’t enough, there was a hefty wind for good measure, and it was strong enough that the Vista Quad seemed to be closed for much of the day. With that going on outside, it was extremely nice spending much of the day getting things done inside instead. 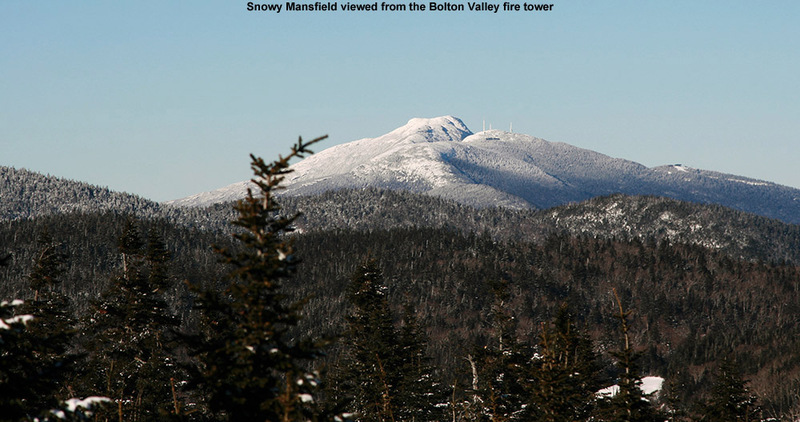 Today’s temperatures were definitely expected to improve though, so after I took care of some work in the morning, I planned on a short tour up at Bolton Valley in the afternoon when the day’s warmth would be at its peak. Under a cloudless sky, temperatures were up into the mid 20s F in the valleys, and close to 20 F even up at 2,000’ when I arrived in the Village in the early afternoon. There was still plenty of wind though, so Mother Nature didn’t seem to want to let that go for some reason. Fortunately, the winds weren’t strong enough to shut down the Vista Quad (yet), and that let me proceed with my planned tour. For today, my goal was to explore the drainage that dropped off behind the Bolton Valley Wind Turbine and led down to Goose Pond. From the pond, I planned to hook up with the Woodward Mountain Trail, connect back to the Vista Summit, and make a front side run back to the Village. The wind was a little brisk as I prepared my gear at the car, so I went with my thicker fleece layer in anticipation of what might be going on up above 3,000’. The resort was definitely winding down in activity from the holiday weekend, and there were only a few people around as I boarded the Vista Quad. It was my first time on the Vista Quad this weekend, and the lift ride was certainly enlightening, albeit somewhat discouraging. The combination of holiday traffic, but probably even more so the strong westerly winds, left the snow surfaces pounded flat, flat, flat. 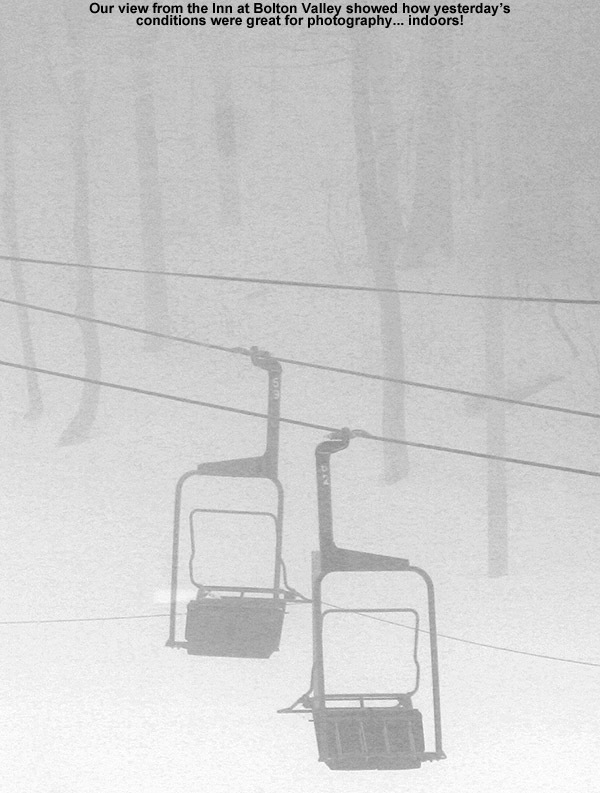 Everything looked packed out; even the trees along the Vista Quad Lift Line seemed to have lost a good part of their fluffy disposition. The resort had that look of an “old snow” scene, with the trails stripped of loose snow, the tree branches devoid of fluff, and even slick patches visible here and there. 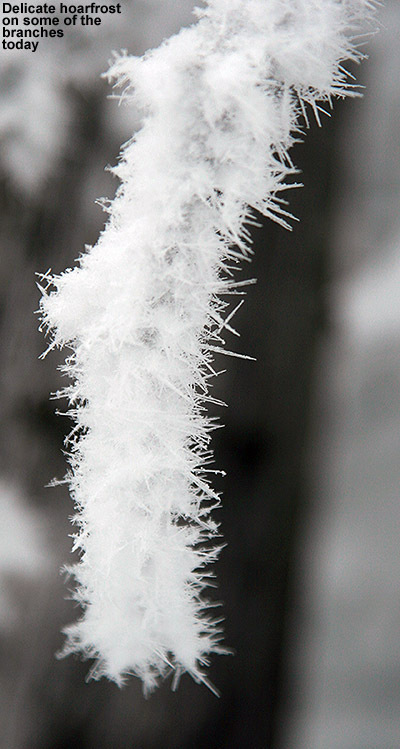 I was thankful that I was heading to the leeward side of the mountain, but the snow seemed so beaten down it seemed hard to imagine that I’d find fluff even there. The lift slowed down and even stopped a few times on my trip up, presumably because of the wind, and I was thankful that I was only planning one ride because I wondered how long they’d be able to keep it turning. Once at the Vista Summit I headed over to the wind turbine, then passed underneath it into one of the openings in the forest. Above the noise of the wind itself, the turbine was cranking away with its own sound of spinning blades. It was really moving in winds that had to be 25 to 30 MPH, and I was happy to see it free of rime and actually doing its job. The noise of the turbine blades in the wind was substantial enough that it actually took a while to fade as I dropped into the drainage and began my descent, but after a few minutes of navigating downward the noise diminished to just the wind itself. Finding a route through the gully was actually quite easy, as there were obvious open areas that could be connected. 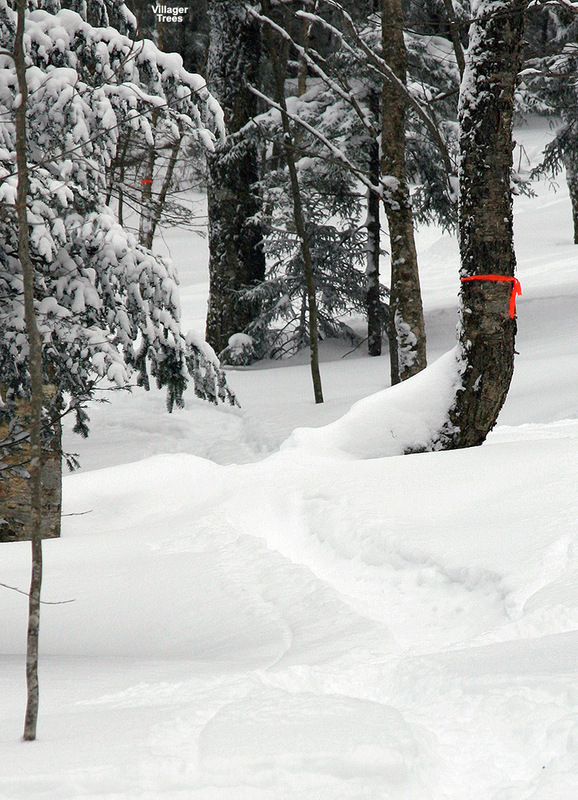 I can’t say that I found one continuous line for skiing, but there were enough open areas to make it enjoyable. A little trimming to connect those areas would make for an even better descent. 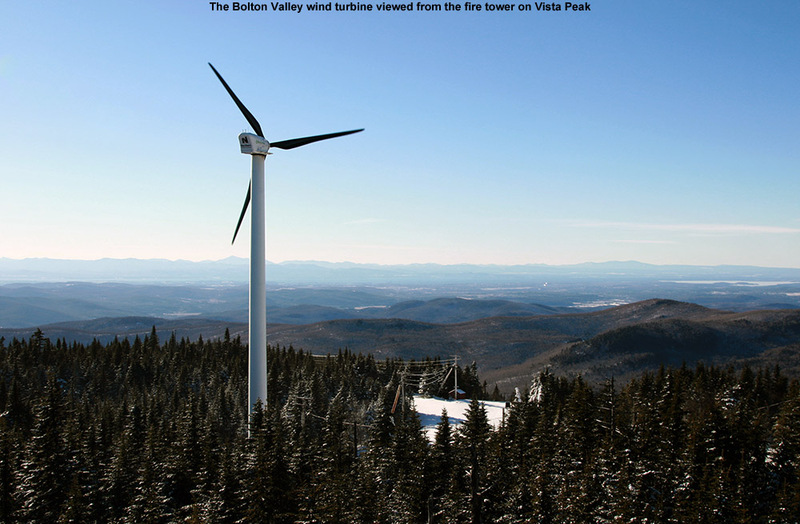 At first I was concerned about the scoured and wind-packed snow that presented itself on the initial drop from the turbine, but that dissipated and only reappeared in a few exposed spots lower down. 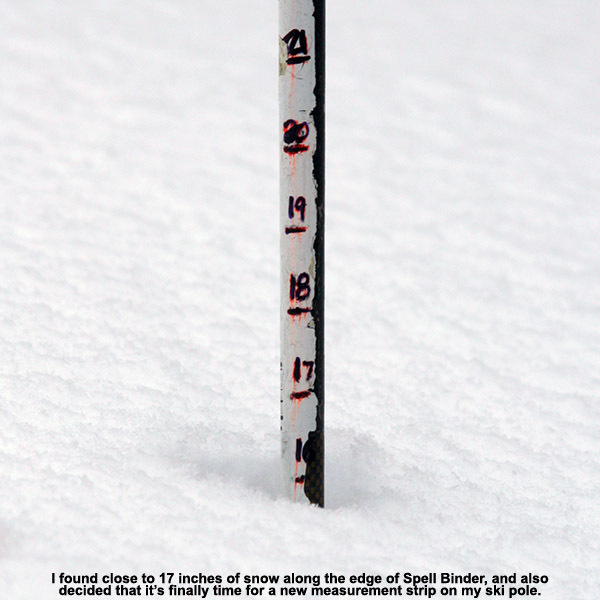 Other than that, the powder was very much like what we found on Saturday – a general 8 to 12 inches, and there was no internal melt layer up at that elevation. 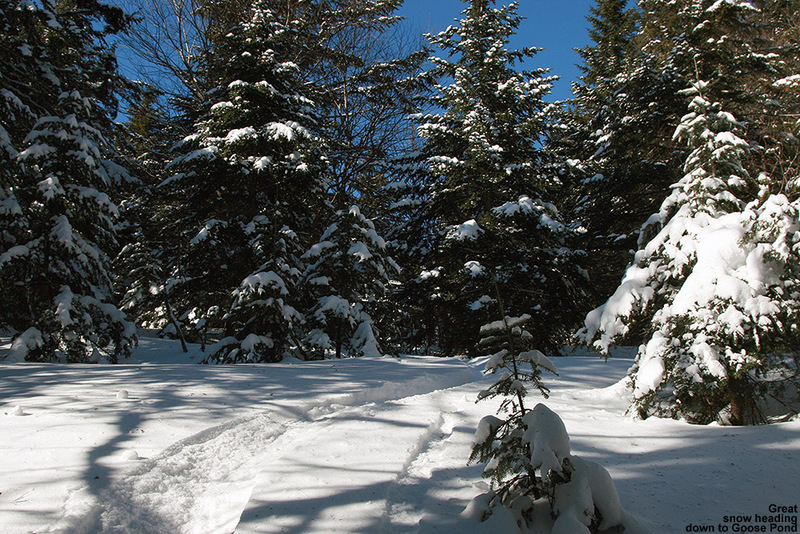 The forest I encountered was a mixture of evergreens with a few hardwoods and a touch of brush here and there, and as I approached the pond down at around 2,800’ it became one of those dark spruce groves that permit little understory growth. Down in the open area of the pond, I found myself exposed to the wind, and it was really ripping. What I observed was a rather austere, winter scene, but not quite the peaceful place it might have been without the incessant wind. I stayed just long enough for a couple of pictures before I retreated into the shelter of the spruce forest. 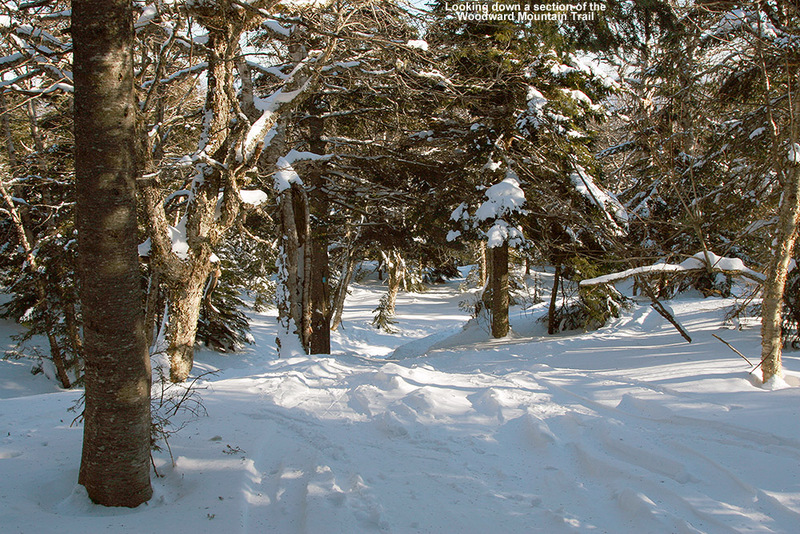 I put on my skins for the ascent, and found an easy route through the spruce; the trees were tall and the only hindrance was the occasional presence of dead lower limbs that hadn’t yet fallen off. 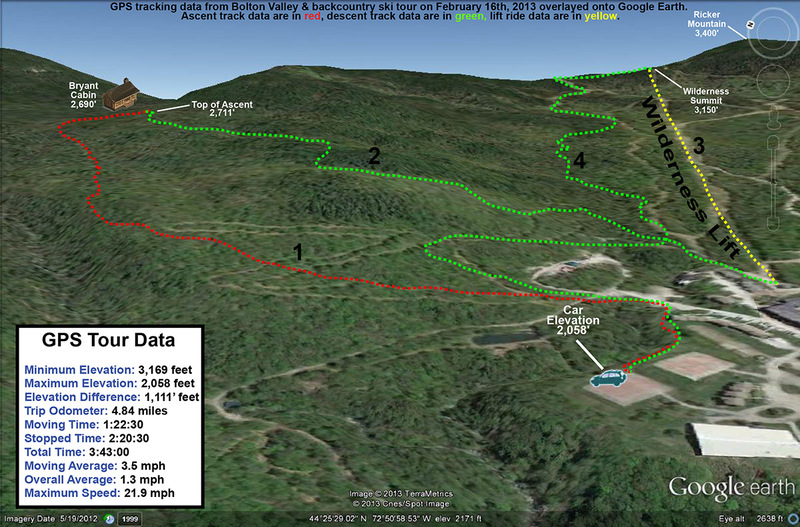 With the help of my GPS, I hit the Woodward Mountain Trail in about 10 minutes, and my pace accelerated at that point because I found that there was a skin track that others had used for ascent. 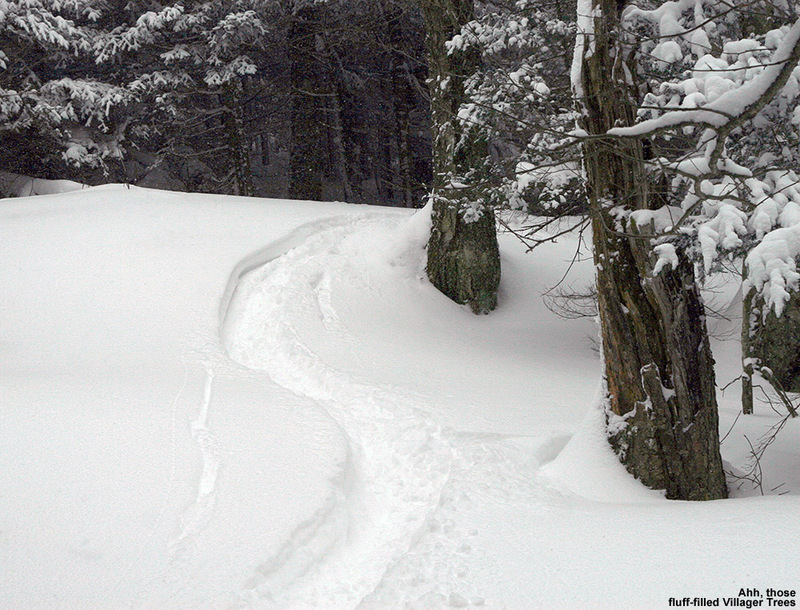 There were a few ski tracks on the trail itself as well, but it hadn’t been used too heavily. 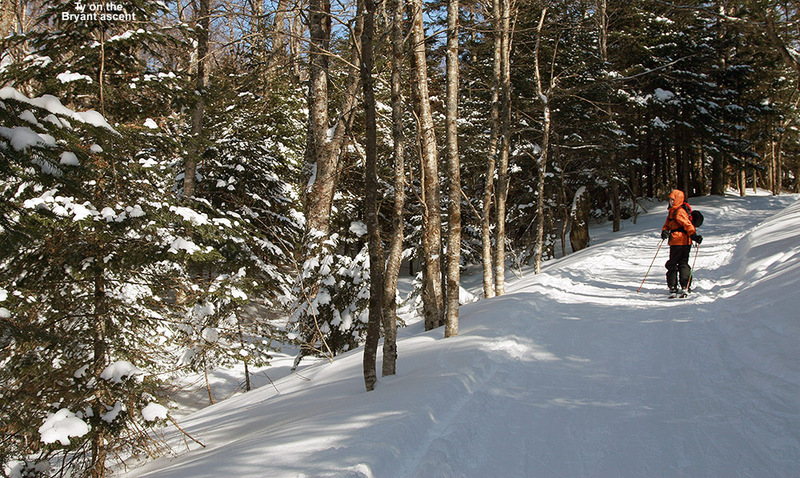 It was easy to see that the trail was designed well though, because it was often just on the leeward side of the ridge and held a lot of powder. 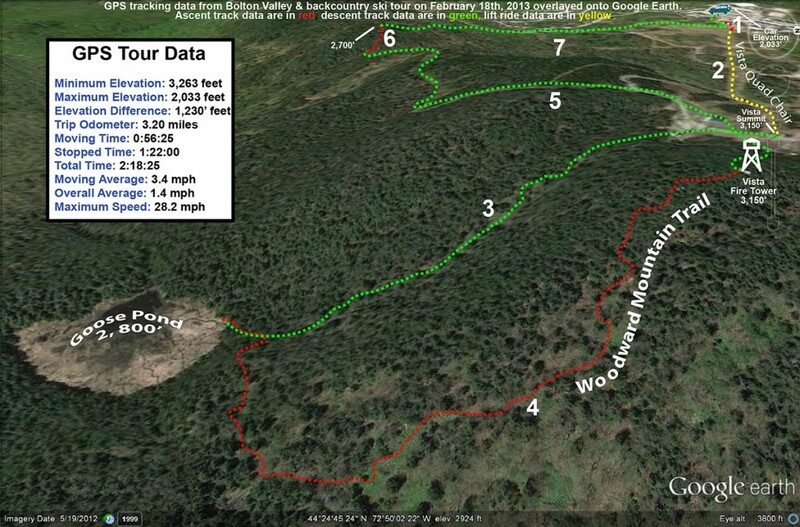 The trail is rather wide in spots, up to 50 feet or more, so I’m sure the turns through there are a great way to start off a tour of the entire trail down to Waterbury Reservoir. 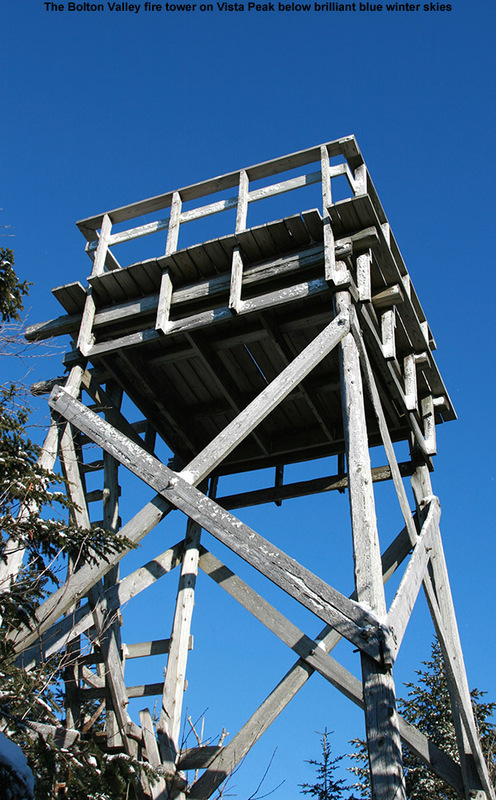 Just before finishing my ascent and emerging back out at the Vista Summit, I hit the fire tower and headed up to take in the view. The wind was intense up top, probably 40-50 MPH, but I was able to get a few photos of the great views in every direction. I quickly got down, took my skins off my skis for the front side descent, and to my surprise (although I guess with those winds not too surprising) when I emerged at the Vista Summit I saw that the Vista Quad was entirely shut down. It was almost spooky how deserted the summit looked for that time of day, but I basically had the whole upper mountain to myself at that point. I headed over toward Cobrass for my descent, and I’m not sure how long the lift had been closed, but the trails had already received a resurfacing due to snow sifting in on the wind. The surface of Cobrass was actually quite nice; it was very easy to dig with my edges, even on my fat skis, and I enjoyed my solo descent. 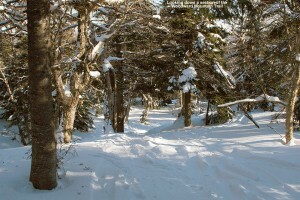 I headed into the Villager Trees and up “The Crack” to the top of “The Knob” to get in some additional powder turns on my way back to the Village. 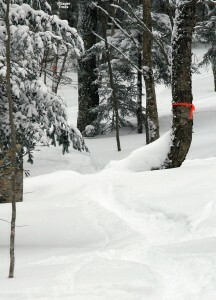 Folks have been busy in that area in the off season, because I could see some new lines in there that looked like fun. 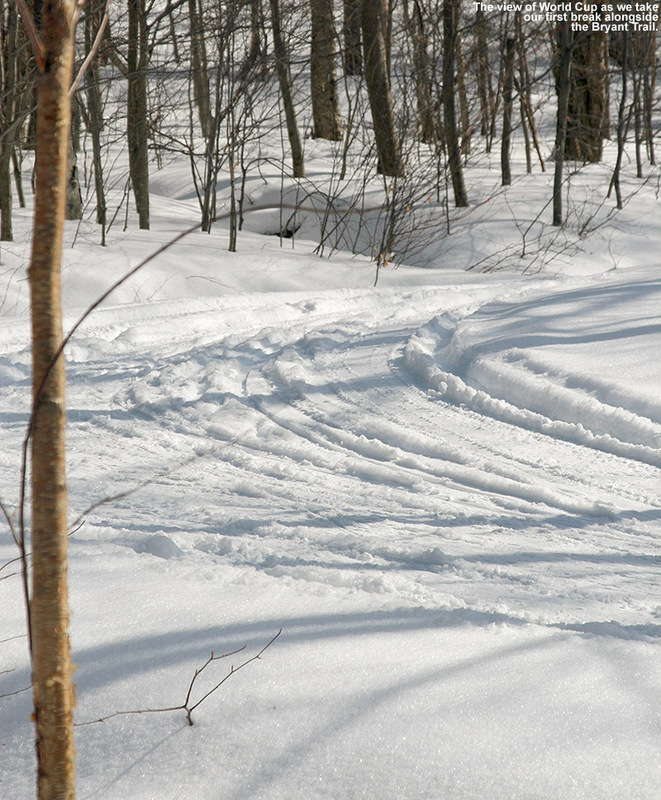 I stuck to a line that I knew, and nobody had been in that area yet so the tracks were fresh. The powder was generally good, although there were some spots where the wind had gotten to it, and I could really feel the assistance I got from the rocker and width of my AMPerages in handling that crust. Down in the lower sections of the trees there had been a lot more traffic, and combined with the wind I had to do a little more work to find the best untracked snow. Those lower sections seemed to fly by though, as I found myself going fast through areas with packed snow and less powder. I finished off my run, stopped in the main base lodge briefly, and then headed to the car. I was surprised to find that the wind had virtually disappeared down at the Village level, despite the way it was cranking along up high. 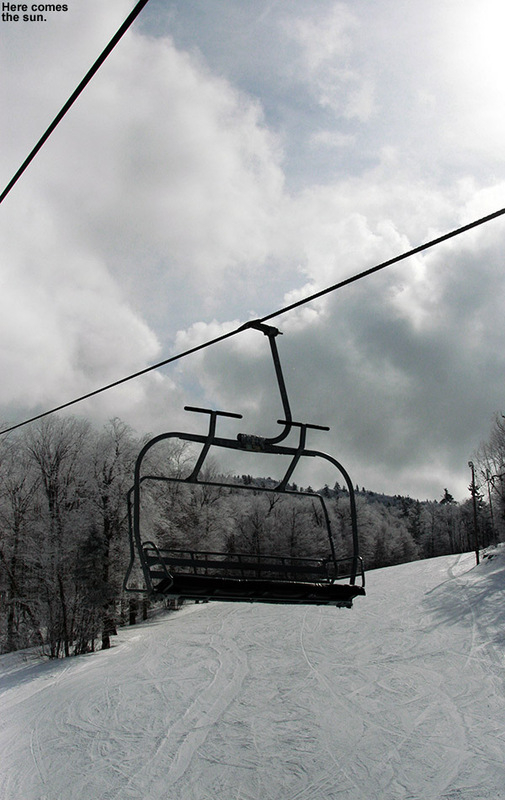 The lower mountain lifts were running, but many folks seemed to be winding down their day as it was getting toward that 4:00 P.M hour. It was in the low to mid 20s F at the base – warmer than it had been when I arrived, and it felt very nice without the wind. It had definitely been cold up high though – my cheeks could still feel that bite that comes along with cold winter air. 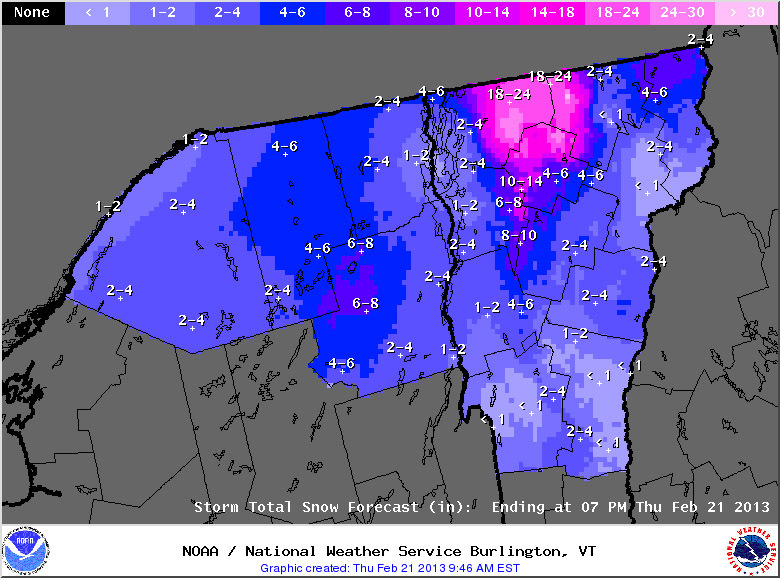 In terms of upcoming weather, we’ve still got a good chance for some upslope snow during the midweek period. 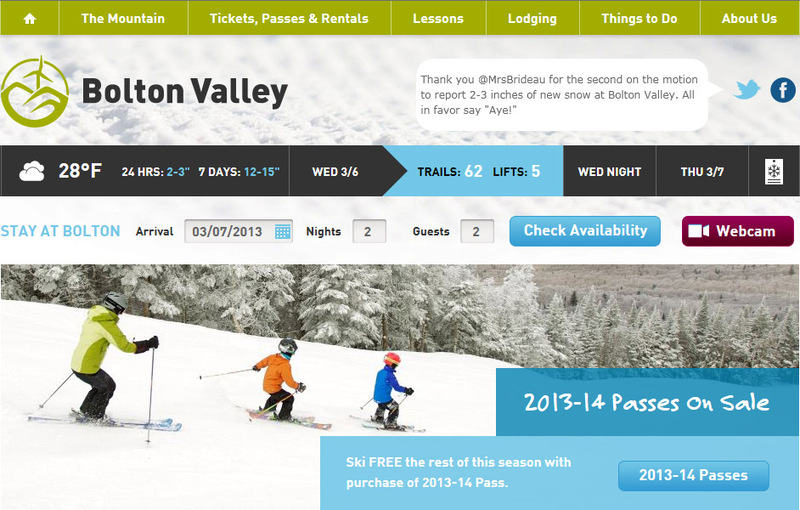 That’s good, because the lift-served slopes could really use a freshening based on what I saw today. 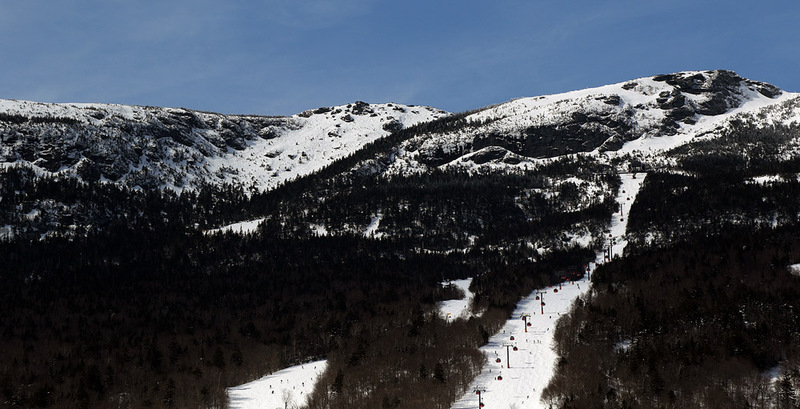 Although the recent midweek storm gave a decent shot of snow to the Northern Greens, with Stowe picking up a foot of snow, and Jay Peak picking up a foot and a half, it’s still been fairly dry in general. 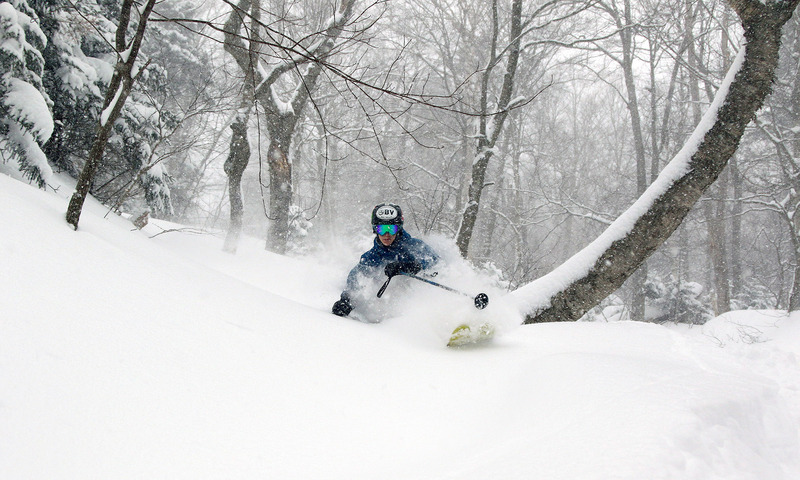 Because of the rather high Froude Numbers for that storm, the more west-side locations of Smuggler’s Notch and Bolton Valley saw them picking up just a half foot of snow during that event, and that’s what Bolton was reporting for their seven-day total as of today. The dearth of snow and a holiday weekend had me thinking a tour on the Nordic/backcountry network was in order, because there’s some excellent snow out there, but there’s been enough time since if fell for lift-served traffic to pack it down pretty well by this point. I devised a somewhat ambitious tour for today, at least with respect to what the boys might be willing to accommodate. It would be an opportunity to show E and the boys the two glades that I discovered last month on the 19th and the 27th. The plan was to skin up Bryant to the Bryant Cabin, descend through the first glade, then connect over to the alpine trail network, catch an assist from the Wilderness Lift to the Wilderness Summit, traverse out on Heavenly Highway, ski the second glade, and return to the car via the Nordic/backcountry network. If we couldn’t complete the whole tour we’d have some opportunities to truncate it as needed. The forecast called for some sun and temperatures in the 20s F today, so it looked like we wouldn’t have to worry about anyone getting cold too quickly. 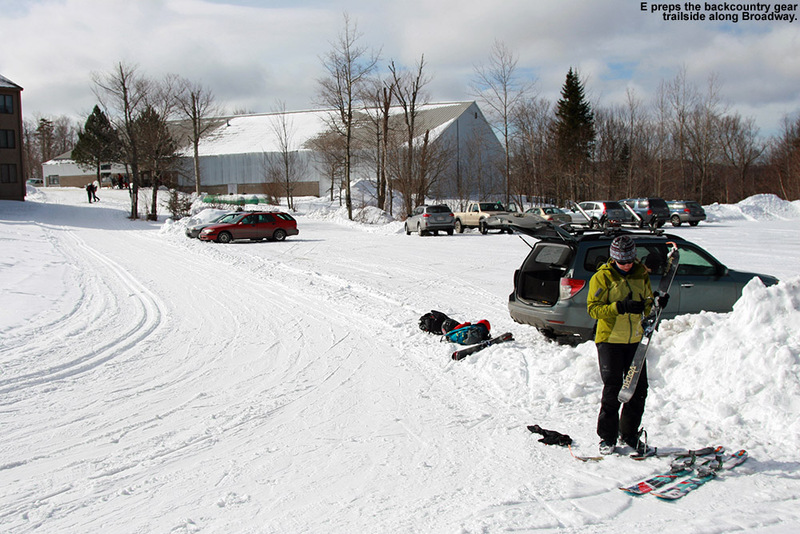 We arrived up in the Bolton Valley Village in the late morning period, and the main parking lots were getting pretty full, but we were able to get a trailside spot right on World Cup in the lower tennis court lot. There were plenty of people about as we began our ascent, including a number participating in the “Bolton to the Barns” event. We ran into Alex, one of my former students on his descent with the event group, and learned that he is now at Tufts Medical School, although he seemed very happy to be back in Vermont visiting Bolton Valley. Dylan asked for just one break on the ascent, and we pulled over into the sunshine along the top section of World Cup and had a snack. Near the start of our tour when we’d passed by the Courtside 1 Condos on Broadway, we ran into a Nordic skier who was pausing there. 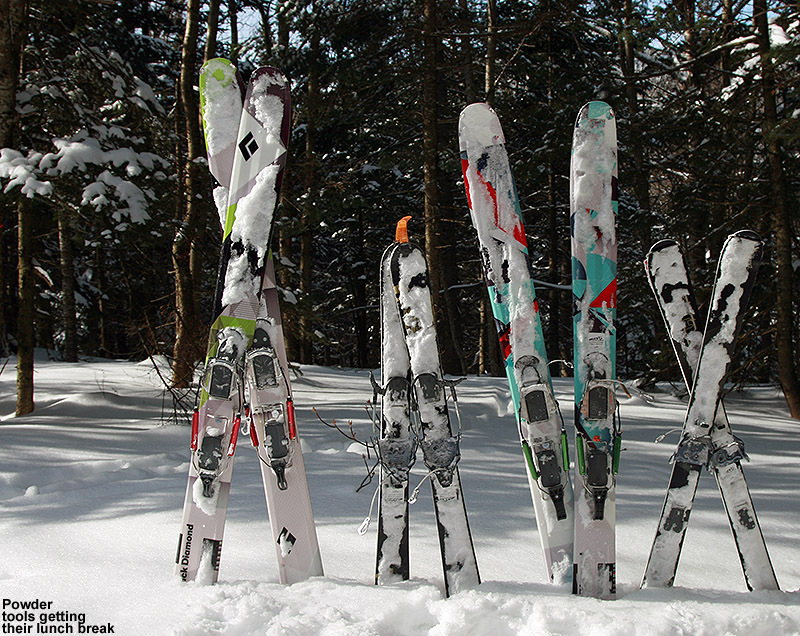 She inquired about the substantial width of E’s fat skis, and E indicated that they were for powder skiing. The woman seemed puzzled because as far as she could tell there was no powder around. 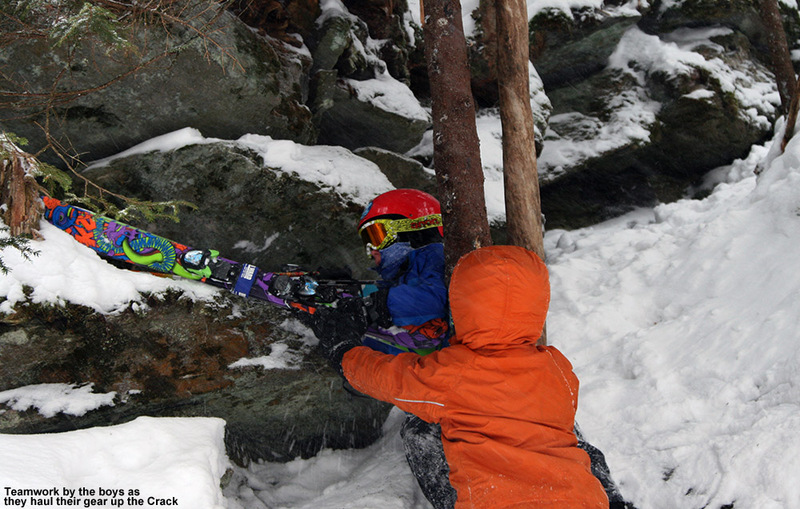 She wished us luck on finding powder, but you could tell she figured it was a lost cause. It was very interesting to hear her speak that way when just a few feet away from her off the side of the trail, you could see the powder sitting there. People certainly have some unique perspectives on snow conditions. 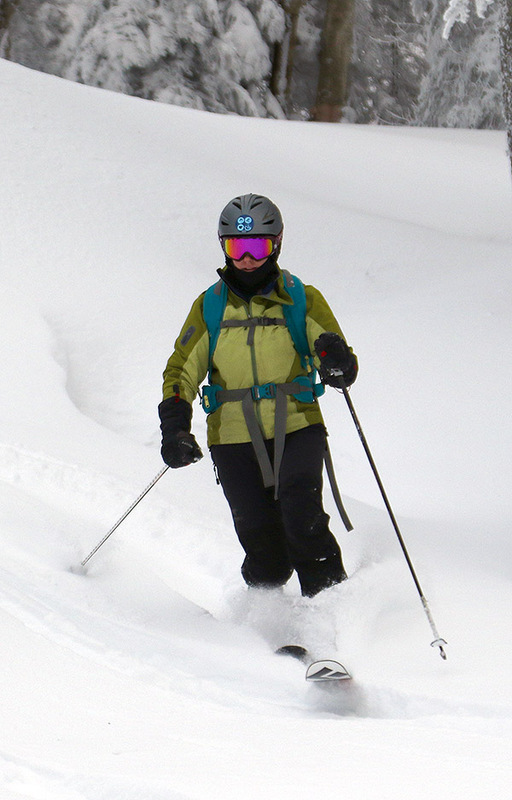 As a Nordic skier, perhaps she’s got a totally different idea of what powder snow actually is, or she may have just been oblivious to what conditions were like off the groomed runs of the Nordic trails. Anyway, in terms of the actual snow conditions, out near the car a bit above the 2,000’ mark there were 2 to 3 inches of fluffy snow above a bit of a melt/sun crust, but I suspected that crust would disappear as we got out of exposed areas and headed up in elevation. Indeed, pretty quickly in shaded areas I found that the powder was deeper and the melt crust underneath was disappearing, and after a few hundred feet of ascent it was essentially gone. Depths of powder above whatever firmer subsurface lay below were in the 8-12” range, with a bit of that melt layer in there in the lower elevations or on south facing terrain. 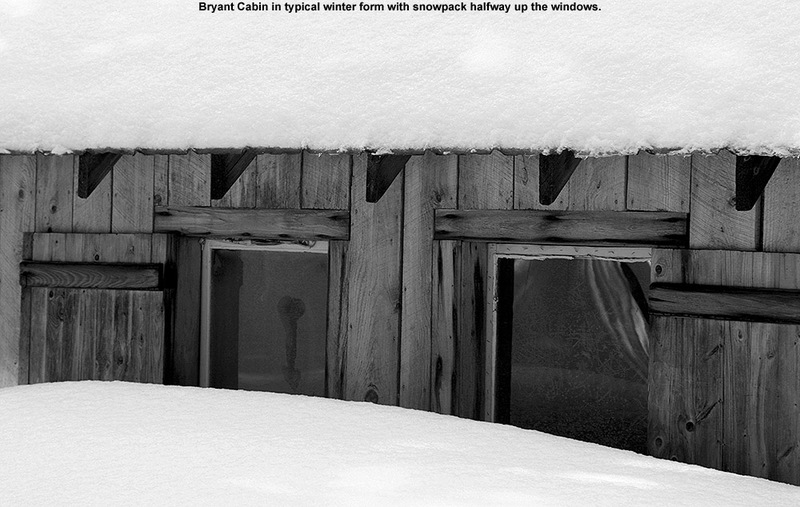 We found the Bryant Cabin in use with the woodstove pushing a fragrant plume of smoke out the chimney. When we talked to one of the guys using the cabin, he said that the resort is no longer renting it or regulating the usage; you can just use it on a first come, first serve basis. I’m guessing that also means that they aren’t supplying wood, which is why we frequently saw him browsing around for dead stuff to throw on the fire. 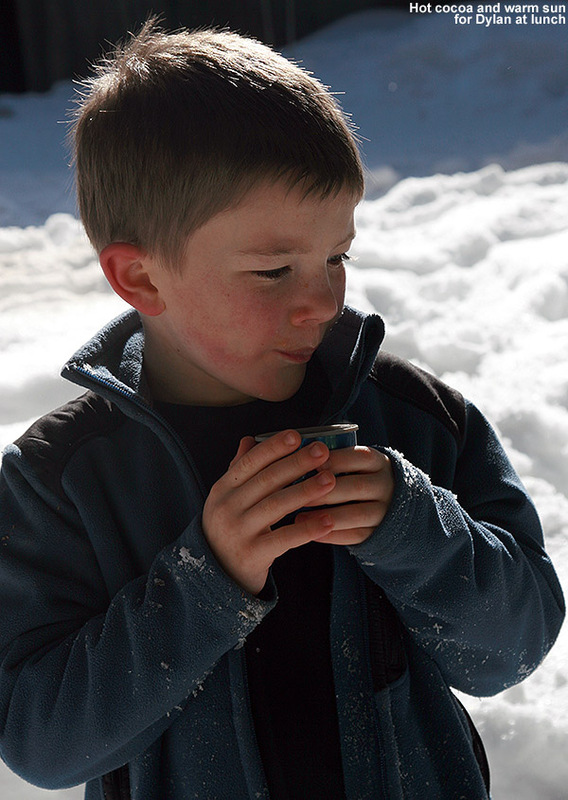 We sat down and had lunch off to the side of the cabin clearing, and enjoyed hot soup, cocoa, and other items we’d brought. Various groups of skiers made their way past while we were there; it was probably one of the busier days I’ve seen out there on the backcountry network, and it was nice that all the people were out supporting the use of the trail system. 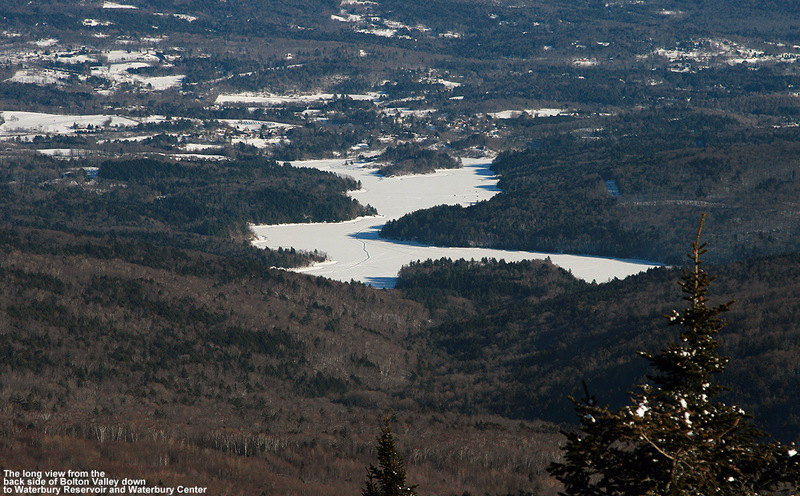 Hopefully the initiative to buy the land with the help of Vermont Land Trust will go through and people will be able to continue enjoying it as public land. Our first descent was in the North Slope and Gardiner’s Lane areas, and the powder was very good in the upper elevations. On our first pitch dropping from North Slope, conditions were just right so that both Ty and Dylan made some nice Telemark turns. 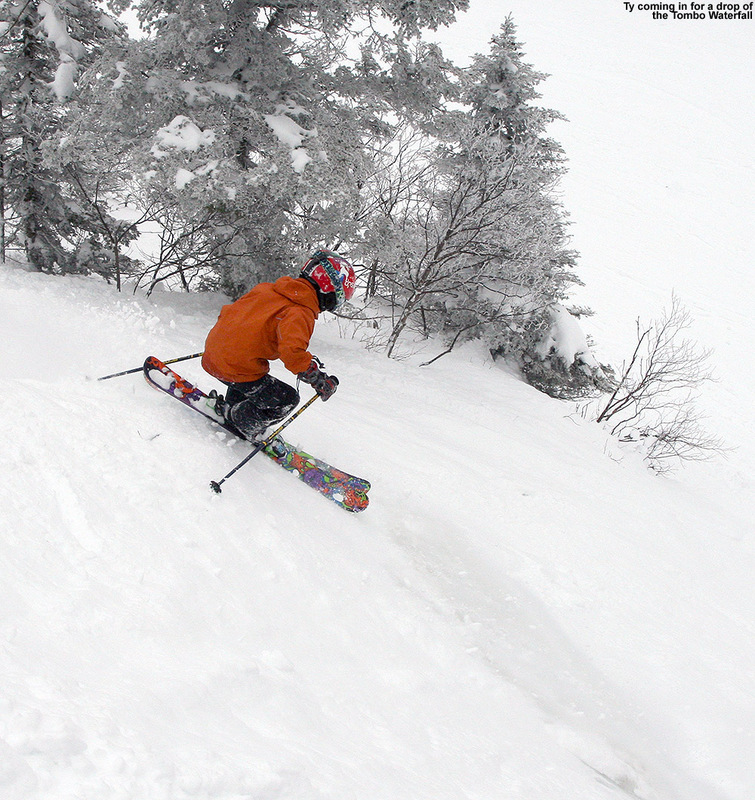 Later, Ty dropped a nice Telemark-style jump turn launching off one of the steeper pitches, and he was very proud of that. The boys threw in a good amount of alpine turns, especially when they wanted to go faster, but it was all around great practice for them. Like I’d noticed on our ascent, the last couple hundred vertical of the descent featured some of that melt crust below the powder. We were on a south-facing slope, so that certainly wasn’t surprising. I found my fat AMPerages to be really helpful in that terrain, and E had some nice turns on her Elements, but she’s still finding them hard to get up on edge in packed snow due to their width. We’re wondering if the play in her boots is just too much and it’s ruining the ability to convey the necessary pressure into the ski. We connected over to the Wilderness Double Chair and took it to the Wilderness Summit as planned, but Ty was pretty insistent on a quick descent without additional skinning. So instead of heading across on Heavenly Highway to drop through the second glade I’d chosen for the day, we opted to descend on Peggy Dow’s to quickly get to Snow Hole. 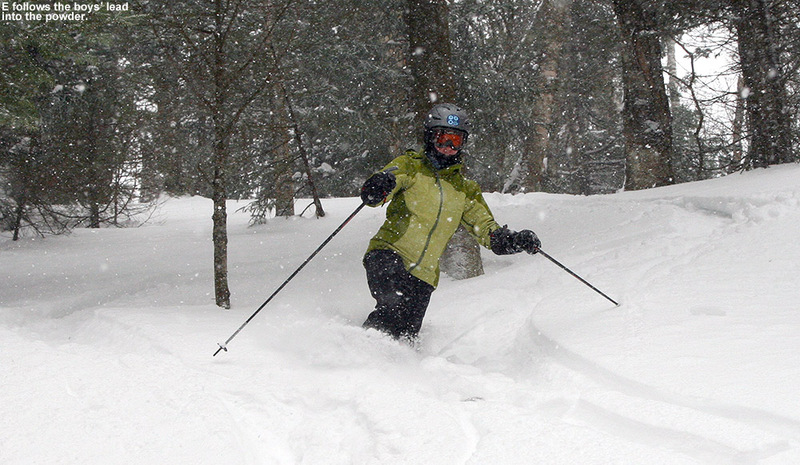 There was decent powder in Snow Hole, although it was certainly more tracked and packed than what we’d seen in the backcountry glades. I got off to the sides of the main route a good deal though and got a number of fresh lines, and at times the boys would follow me. We did make a good connection back onto the Nordic network and caught a few final turns on the Telemark Practice Slope and other lower mountain glade areas before heading back to the car. We’ll be planning another tour at some point to catch that second glade; I still want to show it to E and the boys. Our next shot at snow appears to be coming into the area in the Tuesday timeframe. It looks like it’s going to be a pretty standard frontal passage at face value without much fanfare in terms of snowfall, but there is definitely the potential for some upslope snow. 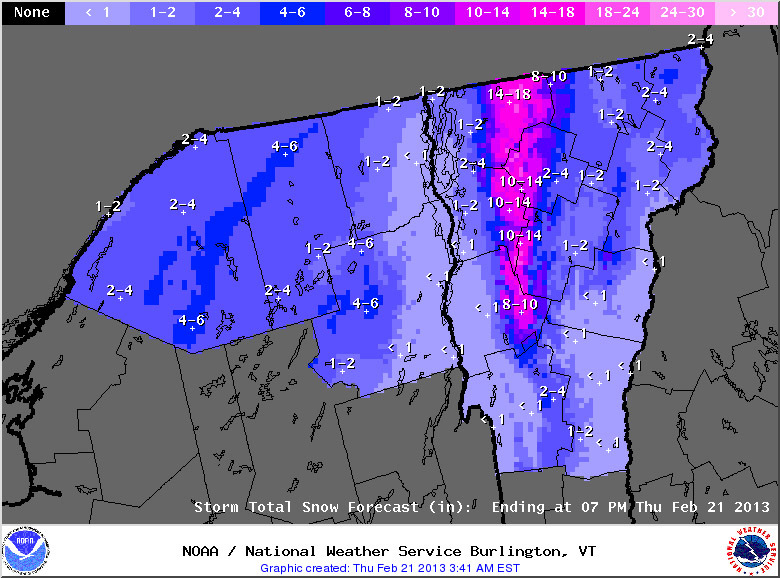 The crew at the National Weather Service Office in Burlington has had their eyes on the potential, and Powderfreak has been watching as well. We’re hoping for that snowfall boost from the upslope snow, because there isn’t much forecast in terms of synoptic snowstorms in the immediate future. The winter storm that’s been affecting Vermont over the past couple of days is actually one that The Weather Channel name “Orko” based on its effects in the Midwest earlier in the week. 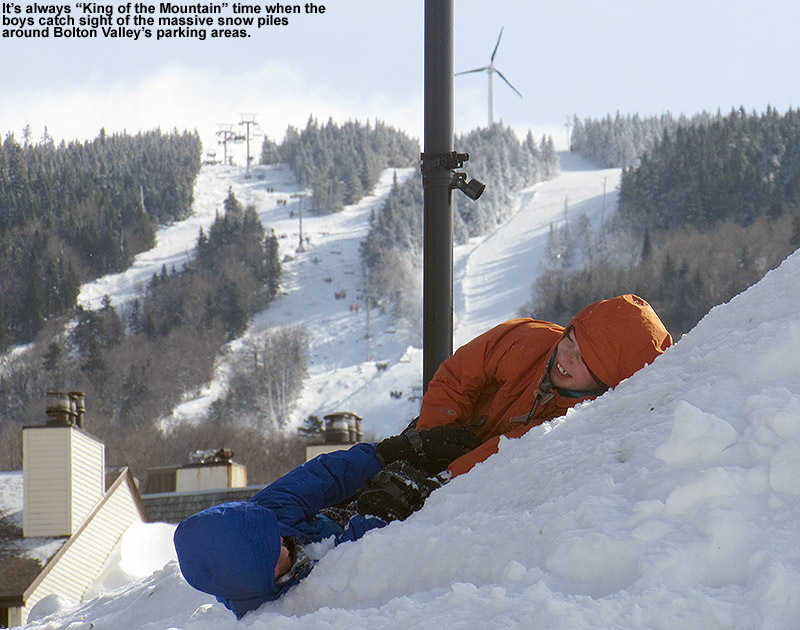 Snowfall from the system hasn’t been widespread, but it has dropped a foot and a half of snow on Jay Peak, and Stowe has done reasonably well with its own foot of fresh powder. 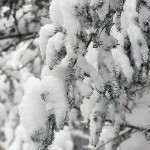 Powderfreak’s fluffy pictures from Tuesday told the story – it was another one of those midweek Mt. 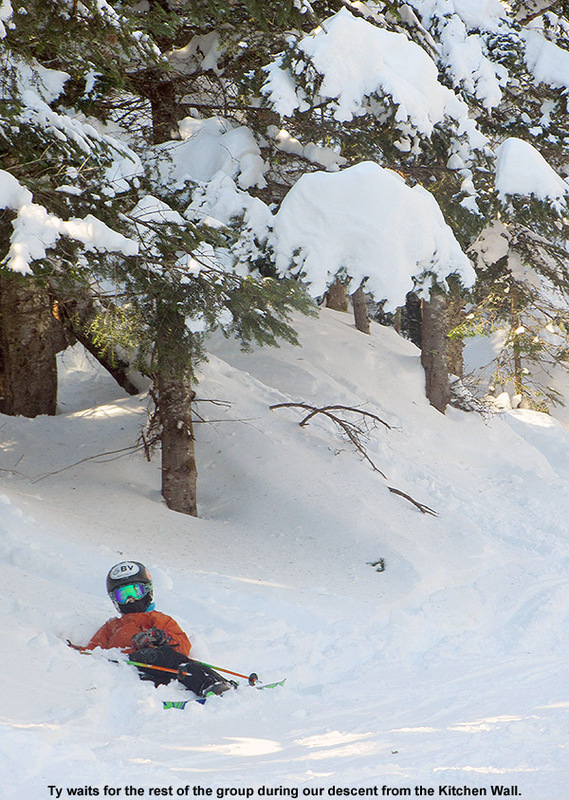 Mansfield powder days that fly right under the radar. 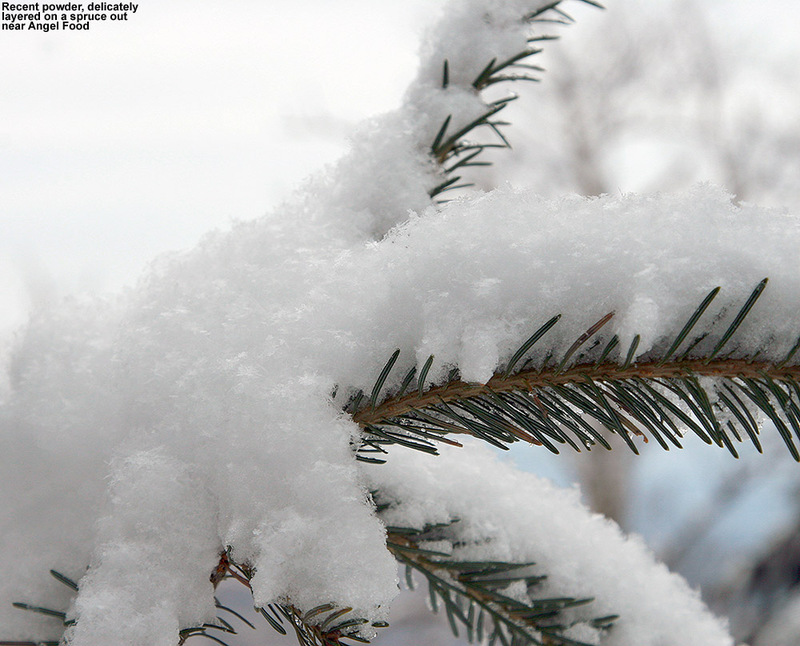 And, the snow wasn’t just fluff; it had enough substance that it represented a reasonable resurfacing of the slopes. 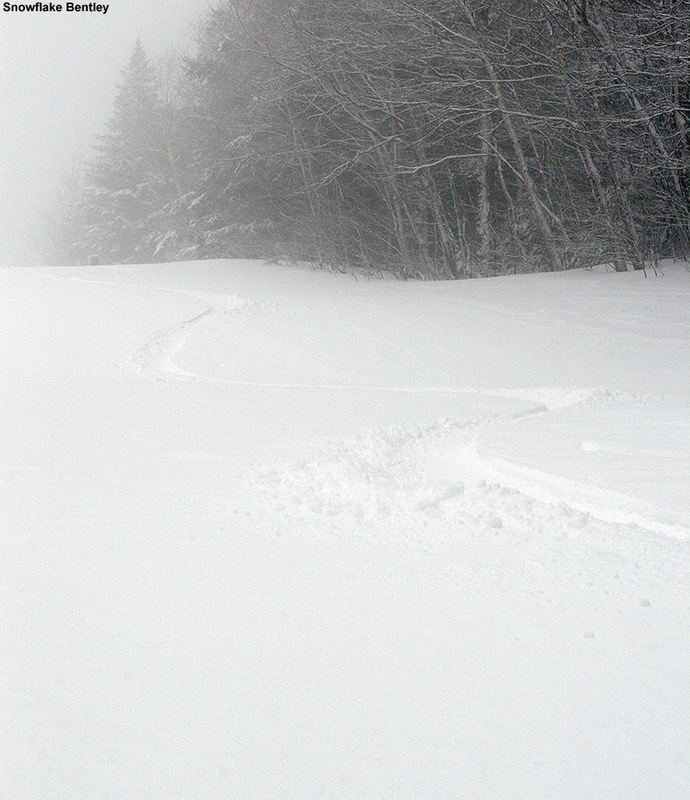 What made the new snow even better was that I wouldn’t say Stowe even needed it that badly based on the conditions we encountered Sunday. With these thoughts in mind, I’d contemplated getting out to Mansfield for a few turns, but when Powderfreak commented in a post on Americanwx.com that “…it’s pretty unanimous in town here that the mountain is skiing the best of the season”, it seemed like it was time to pay the mountain a visit. I’d been too busy to fit it in earlier in the week, but I finally found myself with enough time this morning to get out and make a few turns. The beckoning conditions were certainly enough to get me out to the hill, but I had another good reason to pay Mt. Mansfield a visit. 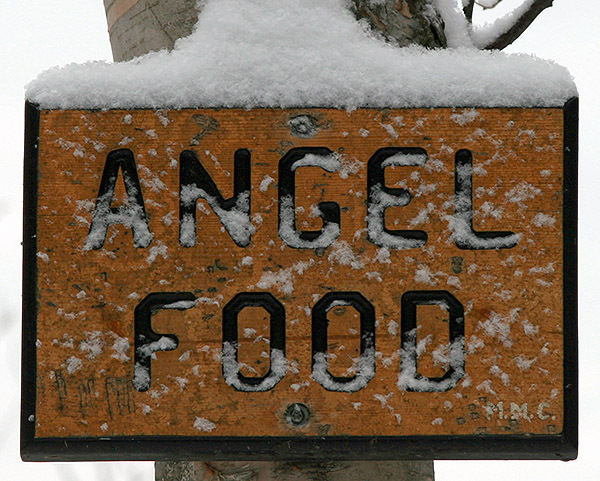 Our Sunday trip out to the Bench Woods with the boys during our BJAMS ski program got me thinking about bringing them out to Angel Food. It’s been a while since I’ve been out that way though, so like I did for the Bruce Trail a few weeks back I wanted to get in some reconnaissance to ensure that the trip would go smoothly. As of yesterday, the Mt. 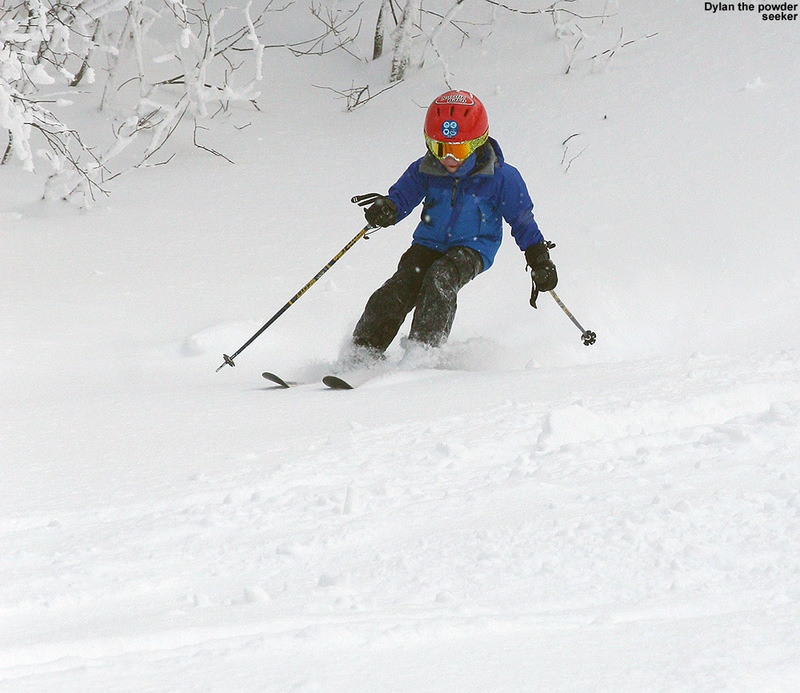 Mansfield Stake was showing a snowpack depth of 57 inches; it was still below average, but only by a couple of inches, and it was certainly enough to provide some decent turns even on steeper runs in the Stowe sidecountry. With the combination of new snow and relatively low, midweek skier traffic, the traverse out to Angel Food was in good shape. I stopped in a few spots along the traverse to check the depth of the powder, and found anywhere from 12 to 20 inches in the high elevations. The main route was certainly tracked up, but there are just so many acres and acres of terrain around it that fresh lines were everywhere for the taking. Even though it was tracked and packed, the snow in the central areas was so good that I actually spent a lot of time there working on turns. 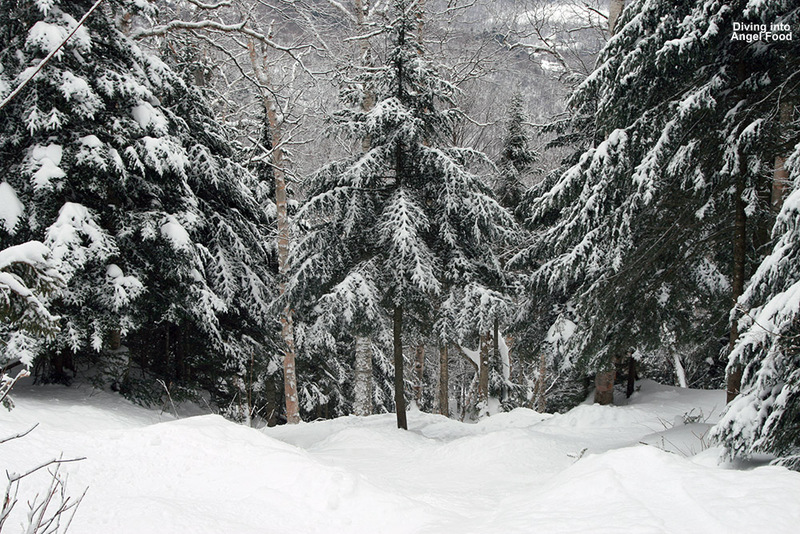 When I did venture off the sides of the main route into other trees, the powder turns were divine, but the depth of the powder definitely started to drop as I went down in elevation. Down near the 2,000’ elevation there was also a thin layer of crust somewhere between the layers of powder. It was often quite subtle, so I suspect it was simply a bit of melt crust from when temperatures in the lower elevations rose above freezing on one of these past few days. I decided to take the traverses that got me back to the base of the resort instead of venturing down to Route 108, since that’s most likely what we’ll do with the boys at first, but we’ll work our way up to some of the other stuff. There was just glade after glade after glade off the main Angel Food route with few if any tracks, so the resort is really set up well for the coming holiday weekend. After getting back to the base, I decided on one more run on Gondolier to really burn out my legs – I was on my Telemark skis so it really wasn’t going to take much. On piste conditions were very good. I’d still encounter the occasional firm spot, so I can’t quite put them down as top notch, but they were way up there. As they have been much of the week, temperatures at the base were right around 30 F, and somewhere in the 20s F up top. Between the fresh snow, midweek levels of visitors, and the perfect temperatures, people who chose this week for their vacation are really getting that quintessential Stowe experience. I think a couple more feet of base snow would really get everything to that upper echelon of conditions, but it’s essentially powder and packed powder everywhere as far as I could tell, so it’s somewhat splitting hairs on the exact level of snow quality. 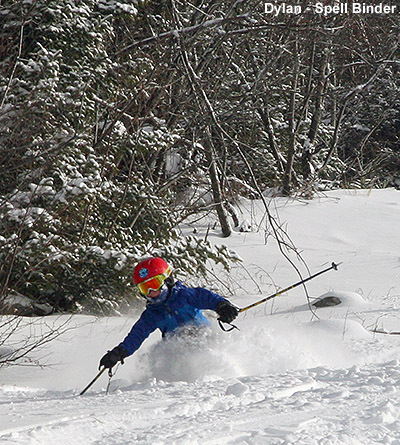 We’ve got some chances for snow going into the holiday weekend, and I’m leaning toward some backcountry turns barring a big storm, but front, side, or backcountry – the skiing is looking good in the Northern Greens right now. 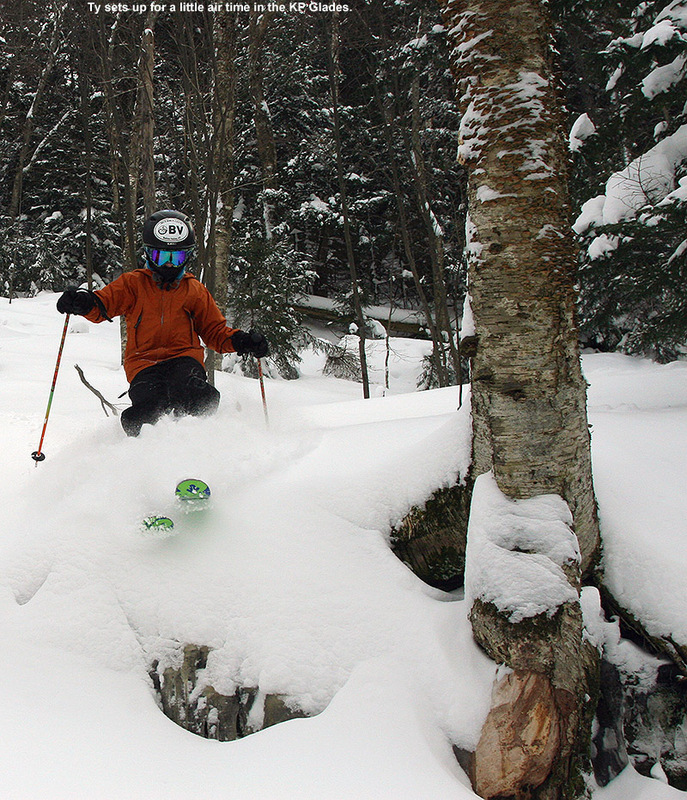 Today was a continuation of riding Nemo’s bounty, and we got to check out how things went down at Stowe. 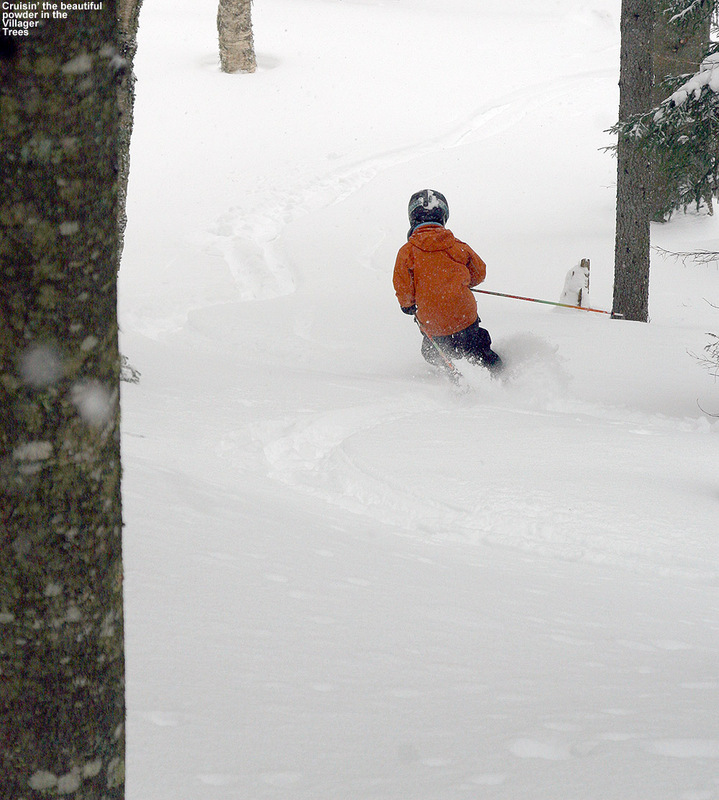 Like most of the Vermont ski areas, Stowe fell in that 1 to 1 ½ foot range for storm accumulation, reporting 14 inches from the event. Yesterday’s cold had also cleared out today, with the forecast calling for sunshine and temperatures in the 20s F.
We kicked things off before program started, with a warm up run off the Sunny Spruce Quad. 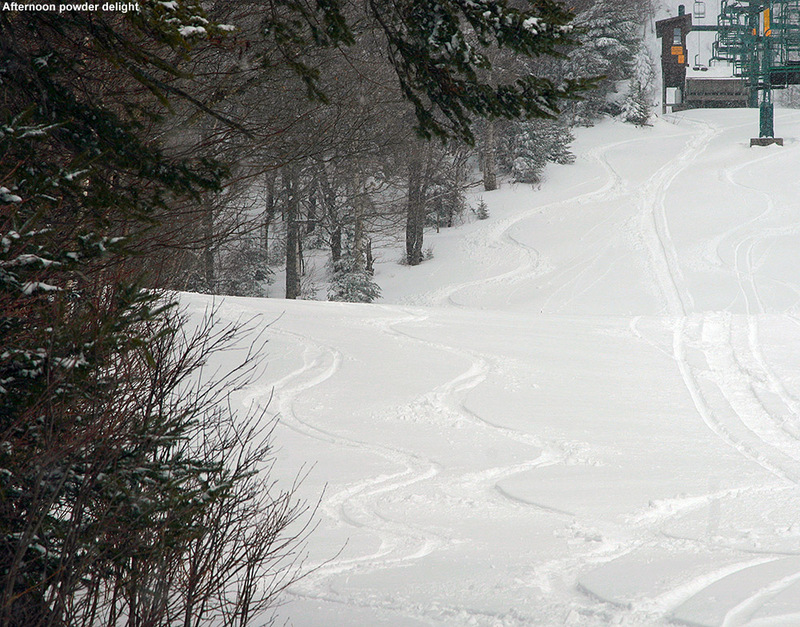 Conditions last Sunday were certainly decent, but it was easy to see that they’d taken a significant step upward today. On piste, the snow from Nemo had been worked into the groomed surfaces to make them quite soft, and off piste there was a good foot of fairly fresh powder everywhere. 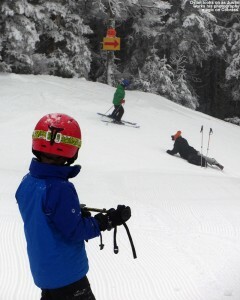 The boys requested a descent along the Sunny Spruce lift line on Lower Smuggler’s and it was some fine cruising. We had time for a second quick run since people were still assembling, so we checked out Nastar Hill and the open terrain above Meadows. When we’d initially arrived at the resort today I hadn’t seen many tracks up in that area, so I figured it might be crusty or tough to ski, but it was anything but tough. It was partially skier-packed snow that was gloriously soft. 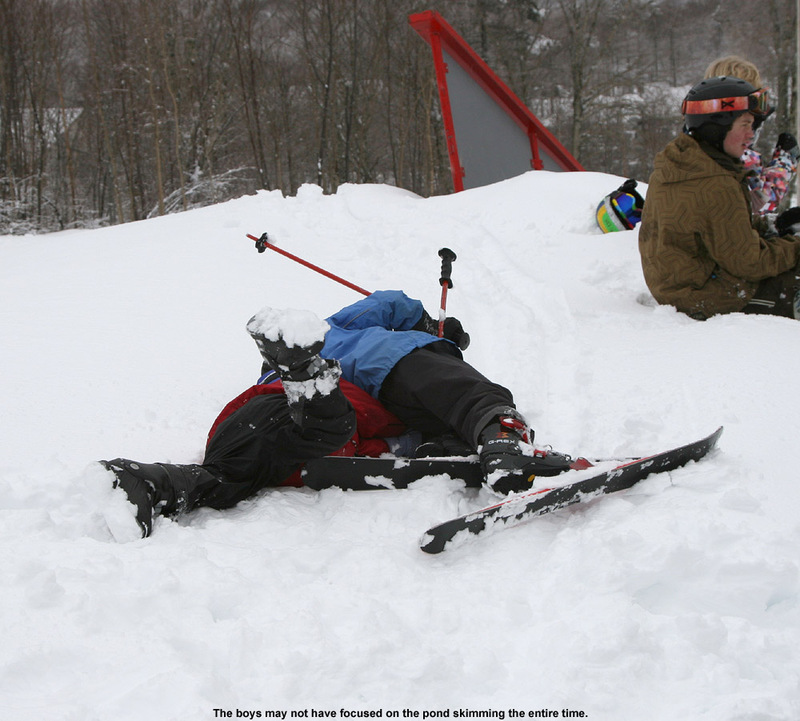 After ripping his way down that face Ty proclaimed, presumably with some hyperbole, that it was his “best run ever”. I get where he was going with that though, in that it was almost effortless. That’s low elevation, south-facing terrain, and the conditions were extremely impressive. 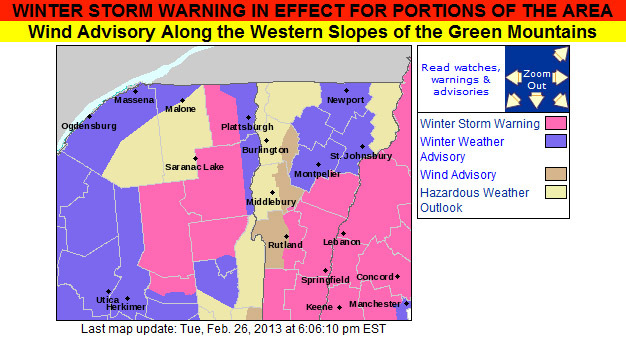 After experiencing that, and having skied west-facing terrain at similar elevations at Bolton Valley yesterday, I’d say that Stowe currently has the edge in terms of conditions. We finally met up with Ken and Jack and made our way over to Mt. Mansfield. With the new snow that has fallen thanks to Nemo, I decided that a Kitchen Wall run was in order, and the boys were fired up for that. 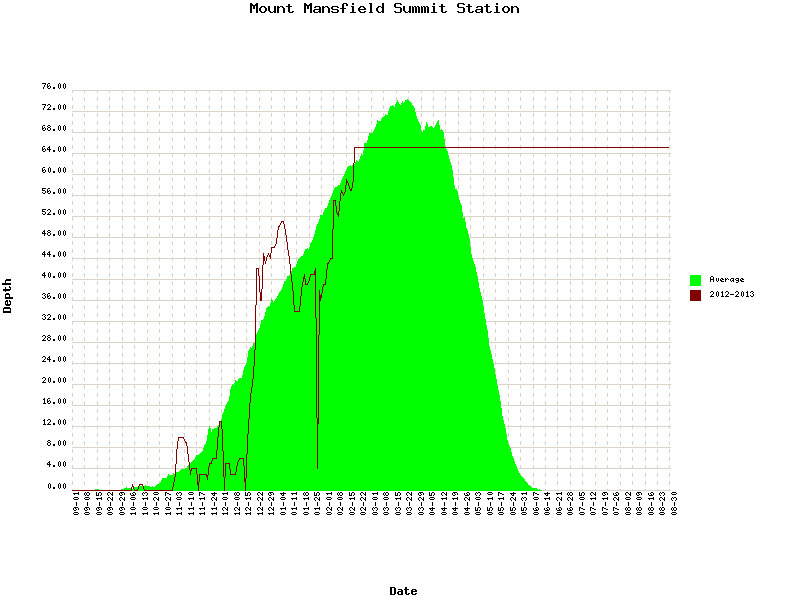 The snowpack depth at the Mt. 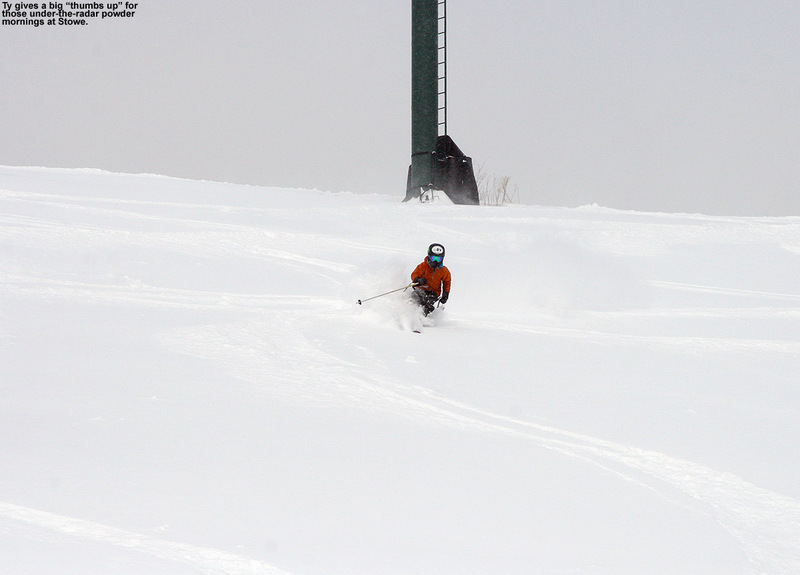 Mansfield Stake has jumped to 55 inches with the addition of the recent snow, so that’s getting it up not too far below average. The Kitchen Wall traverse is in decent shape, although certainly not as soft and filled in as it could be. 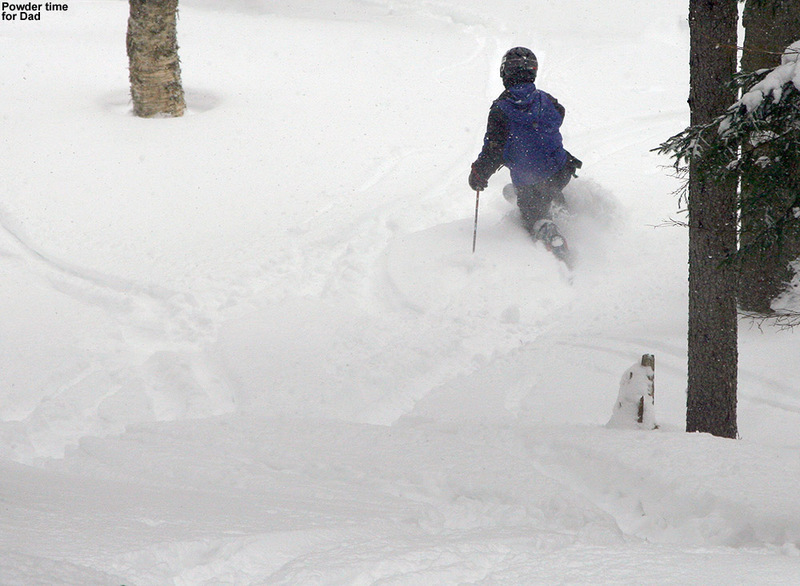 The snow in there was nice, with plenty of areas of untracked powder remaining if you were willing to poke around. Down below we found Nosedive a bit firm in the middle at times due to the manmade snow, but the edges were great and we worked those all the way back down to the Gondola. Another big plan for the day was to bring the boys out to the Bench Woods, since only Dylan has been in there with me. The first chutes bypassing Upper Gondolier were simply heinous – they’re cut overly tight for their very steep pitch to begin with, and with the traffic that has been in there, the coverage is worn down way too low. Another couple feet of base are needed in there to make them respectable. Even before we went in, I told the boys that I usually skip those chutes because they hardly ever ski well, but I wanted them to at least experience what they were like. Well, one trip was enough for them to realize why those chutes just aren’t that great. Down in the Bench Woods the powder was actually quite plentiful. Ken and I had a blast gliding our way down the center of a small streambed that just kept going and going. Luke and Jack definitely struggled in there though, since there are a lot of saplings that make many lines feel tight, and they don’t have a ton of experience in that terrain. Ty and Dylan handled it well, although they did get a bit bored waiting for the other boys if they were getting stuck in the powder or having trouble navigating. It’s a long run as it is, but between the struggles and boredom, Ken and I were probably the only ones really having an all out blast. 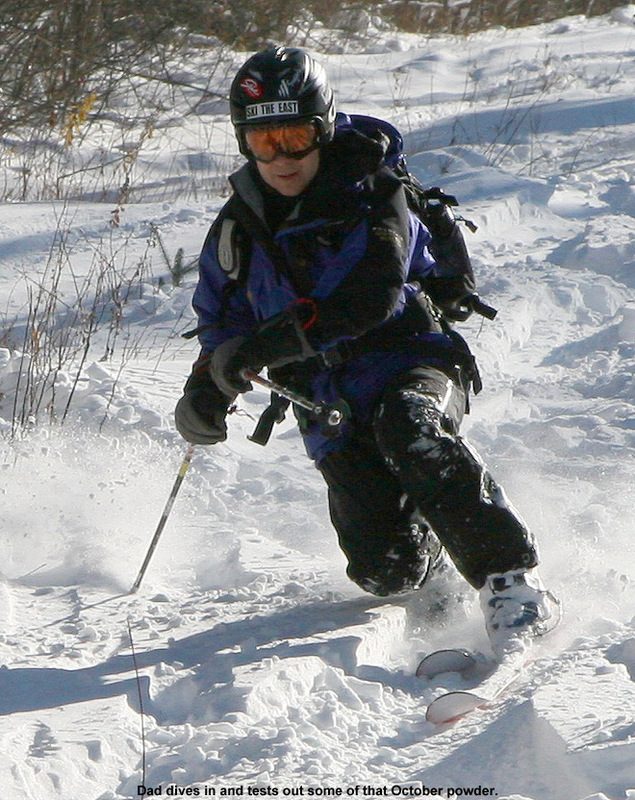 However, we had a lot of good teaching moments dealing with the nuances of skiing that sort of terrain. 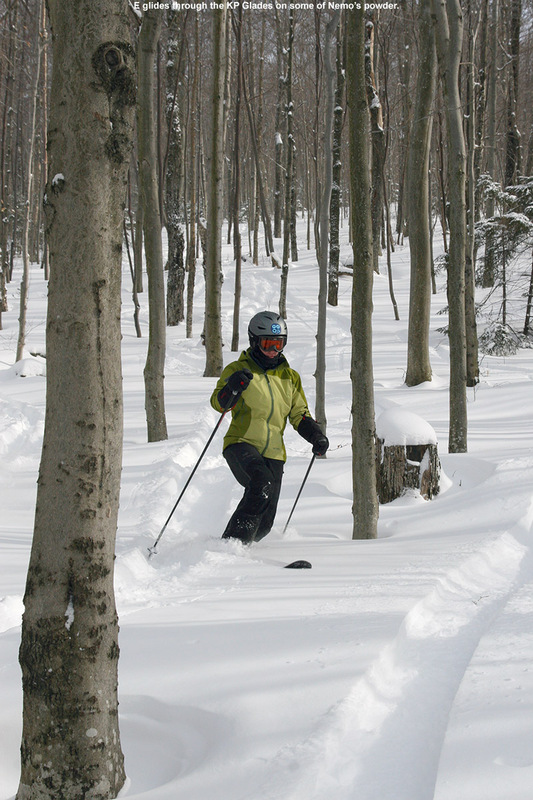 The past couple of times I’ve been in there, it’s seemed like there’s a lot more underbrush compared to what I remember back in the 90s – I just think the whole place needs a good pruning and it will ski many, many times better. Coming back out of the Bench Woods felt like a never ending saga for the boys, so when we finally arrived, I decided that they’d earned a good snack break in the Midway Lodge, just like Dylan and I had done that last time we’d skied in there. And, just like Dylan and I had done, we kicked back near the Fireplace in the near solitude of Midway in the late afternoon. For a snack I grabbed what looked like some maple granola made by Mitzi’s, a local Stowe company also known as Fresh Mountain Foods. That granola is fantastic, and when I shared it around among the group everyone was impressed. I suspect they carry it in other parts of the resort, but it’s going to be an excuse to get me back to the Midway Lodge. After the extended break to recover from our Bench Woods adventure, we had time for one more run. We decided to keep it simple due to the late hour, so we just did a Perry Merrill to Gondolier run. The snow was again quite good, and excellent along the edges. About halfway down I heard the boys yelling about something they could see off in the distance, and the best we could tell, since it was way down in the base area, it looked like a car was on fire. Black smoke was billowing hundreds of feet in the air, but it was hard to imagine that it could actually be a car on fire. 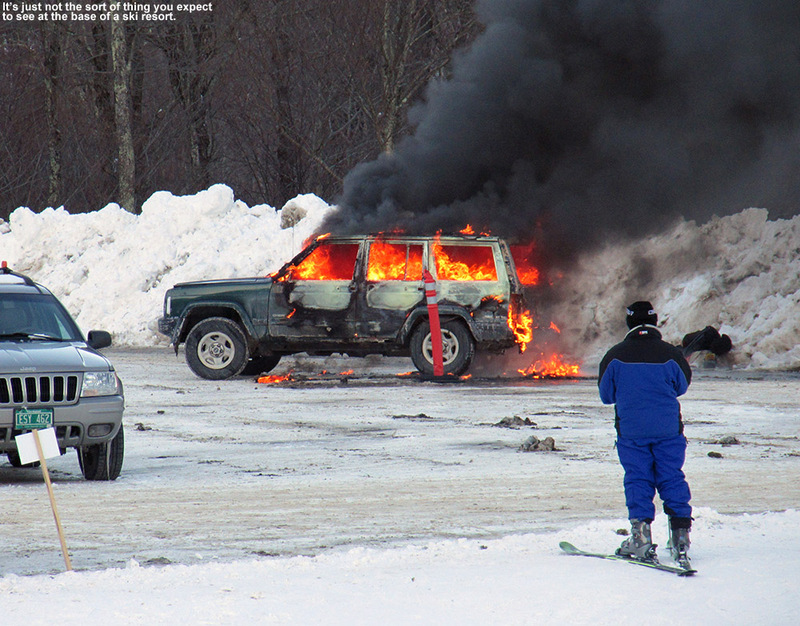 We rushed down to the base, and low and behold there was indeed an SUV on fire. 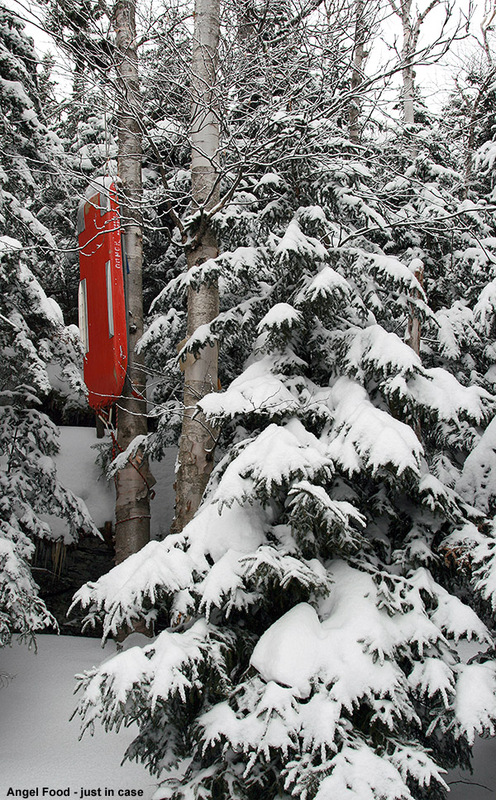 It was the weirdest thing, and not something you’d expect to see at the base of a ski resort (or I guess most places for that matter). I’m not sure what caused it, but perhaps we’ll hear about it in the paper. The boys wanted to hang around for some food, so we had a mellow meal by one of the south windows in the mostly deserted Great Room Grill. Claire is off to Africa for a couple of weeks, so she and Luke weren’t there, and Jack and his family were with some other folks over by the Spruce Camp Bar. Jack and the boys played some sort of hide and go seek around the lodge though, and kept themselves amused until we finally had to reel them in. At least E got them to eat most of their food – they often forget to eat and then they want more food when we get home. We’ve got another winter storm coming into the area tomorrow. It’s a low pressure system that will be working in nearly overhead out of the Midwest, and in The Weather Channel naming scheme this one is called “Orko”. Down here in the valley it sounds like we’ll have a bit of rain with snow on the front and back ends of the storm, but it sounds like the higher elevations are going to be mostly snow with perhaps a little sleet. You folks better get your space heaters in order, no one wants frozen toes. 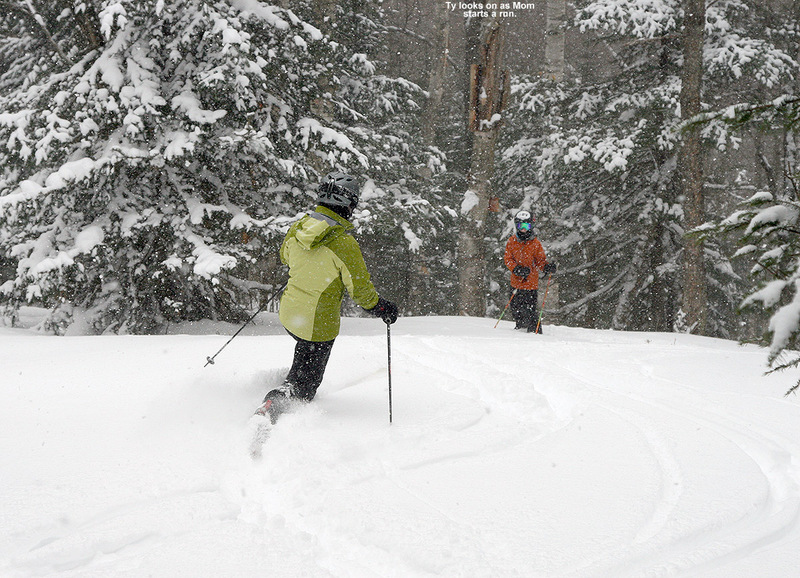 The current forecast calls for 5 to 9 inches in the Mt. Mansfield area, although the models are showing some good potential for upslope snow on the back side lingering into Tuesday night, so totals could ultimately be higher than that if the upslope really kicks in.